Mirrorless cameras appear to be on an unstoppable rise, and appear to be diminishing the popularity of DSLRs, if not making them seem archaic. The benefits over a DSLR are compelling, primarily the size and weight. I am also drawn to the trend of styling harking back to the film rangefinder era; the resurgence of aperture rings and shutter speed dials in particular. Widely available adapters for almost all lens mounts and the focus peaking available within EVFs is a huge boon to using old manual focus lenses, like the collection of Ai (and pre-ai) Nikkors in my collection. I’m rarely a first mover when it comes to camera gear. As an amateur I think it’s far more financially prudent to buy gear that is second hand, a model that has been out a while or both. So when I saw a second hand FujiFilm XE2 in the window of my local camera shop earlier this year for around £200 I thought this was a great opportunity to see what all the fuss was about and to fill a gap for a lightweight performant camera that had existed since I sold my Canon G15 compact. Personally I love the design and ergonomics of this camera. The whole FujiFilm line looks great from my perspective. As for weight - partnered with one of Fuji’s compact primes (I use the 18mm f2) it’s far less heavy and compact than any option I have with my Nikon D7100 DSLR. This is important for me for activities like hiking, but also for when I’m doing a trip with my Bronica medium format camera. Taking a full DSLR and Medium format film set up equates to a very heavy bag (10KG+) which isn’t much fun to lug around. So how did it perform? I took this camera along with my Bronica to Lanzarote in October and gave it a proper run out. Overall very good! I didn’t miss the bulk of my DSLR and was great for hiking with. Sharpness / resolution of the sensor + 18mm lens is well upto my standards (although maybe the 18mm f2 is a bit softer in the corners than I’d like). I also accompanied it with the Nikon 50mm and 100mm Series E lenses, two of the most compact Nikon F mount lenses available, and whilst that worked OK, the focus peaking around infinity seemed a bit problematic. The Fuji to F mount adapter is not designed to retain the exact focus of the lens - I.e. the infinity hard stop ends up well past infinity on my copy. This will be important to bear in mind in future. A couple of surprises, for long exposures with an ND64 or 10x ND filter the EVF would adjust its brightness so you could actually compose and focus your shot whilst using these filters. A nice change from the blackout you get in a DSLR viewfinder! I was a bit confused when trying my first long exposure though, as it seemed impossible to set the shutter speed (with the T setting) to multiple seconds. It turns out that you need to disable the electronic shutter to do this - a case for reading the manual before using the camera! As for the images they're perfectly fine. It doesn't seem entirely fair to compare these photos to ones from my D7100 as the lens selection I have for the F mount far surpasses the Fuji, although that being said I do prefer the overall image rendition from the D7100 so far. Insofar as the quality to size/weight ratio this Fuji has thoroughly impressed me and seems to fully fit the gap I had - a small lightweight performant camera for short trips where photography was a secondary purpose and/or involved alot of hiking. So in conclusion when judging this camera on price/performance/size/weight it excels. Its a great digital companion to the film shooter with similar ergonomics and also little details like the standard threaded shutter release is very helpful for using the same gear between this and a film camera. Whilst the EVF took me a while to get used to (and frankly I still prefer the optical finder in all situations except using strong ND filters) its overall not so bad and is a boon especially when using an adapter with old film lenses to see focus peaking and exposure. Mirror-less probably represents a significant fraction of the future for digital photography and leaves me with a bit of a conundrum. Really I had wanted Nikon to come out with a mirrorless that was a native F mount and kept with their design choices to maximise compatibility with their older lenses. The Z6/7 cameras don't use the F mount, so an adapter is needed anyway, plus they are positioned at a much higher market than something like the XE2. How I do wish they would come out with a mirrorless Nikon FM styled body at a reasonable price. This does mean if I wanted to swap to a mirrorless system I'd probably be better selling all of my Nikon gear and migrating to another brand like Fuji. Given my sunk cost in Nikon gear and my love for their film SLRs I don't think a switch will be anytime soon, so this Fujifilm XE2 works quite well as a comprimise. 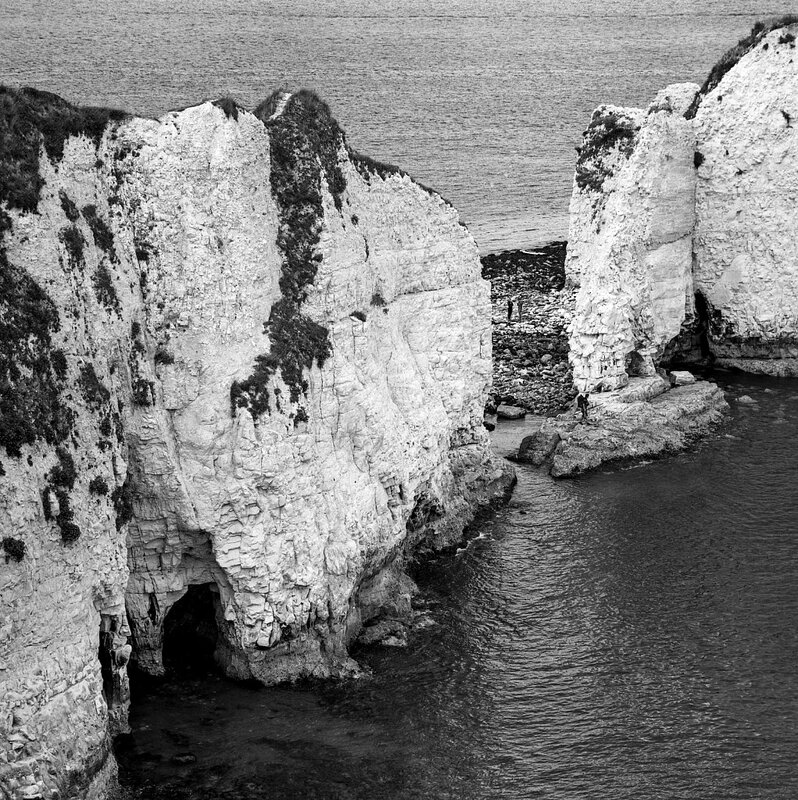 For the late August bank holiday I ventured to the south coast with the aim of capturing a few shots of the Jurassic coast with my Bronica. 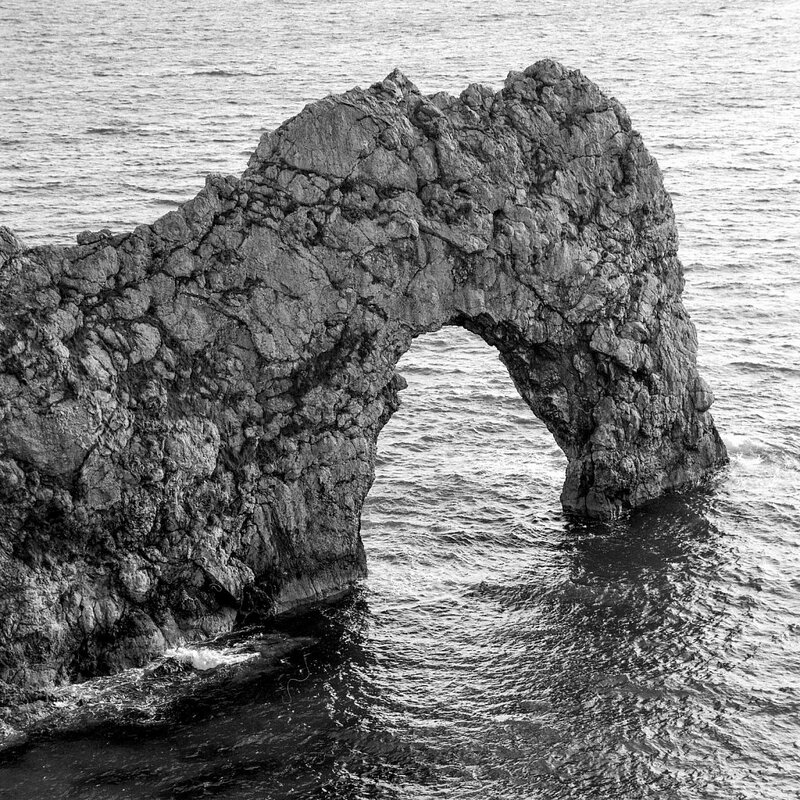 Its not a part of the country I had ever visited before and Durdle Door had been on my to-see list for some time. 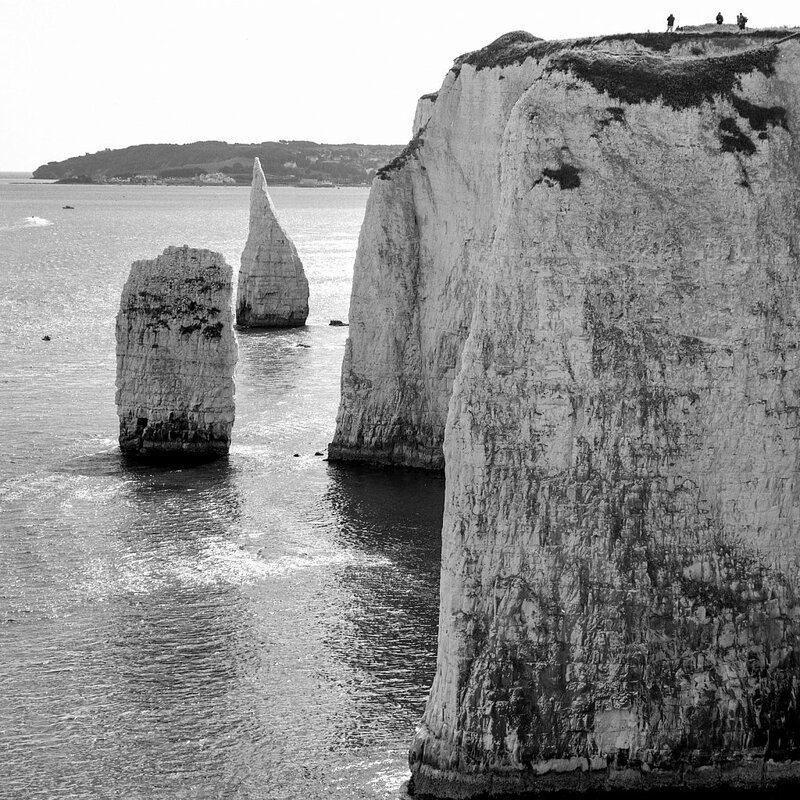 So I took the train out of Waterloo station to Poole on the Saturday, rented a car there and took off to Old Harry Rocks. My Bronica accompanied me with some Kodak Ektar and TMax 400 loaded. I had two rolls of Ektar loaded, one in 35mm and one 120mm. Previously I have written about using a DIY adapter to shoot panoramic 35mm film in the Bronica but recently I saw a normal 35mm back for sale in my local camera shop and decided to pick it up. I'm only halfway through finishing the roll and I'll do a writeup of that experience when its done. 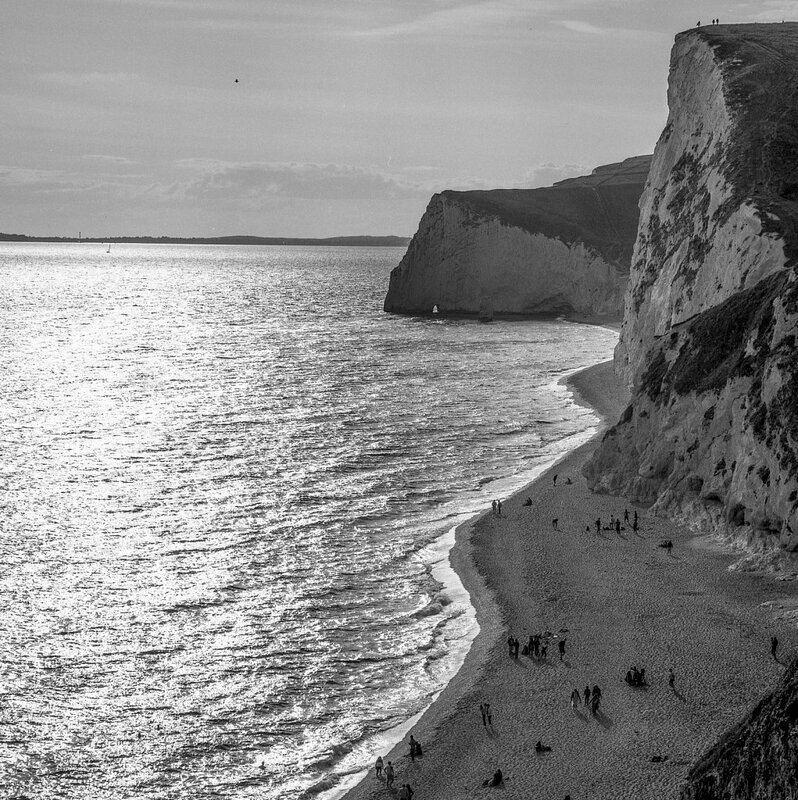 It's a longer than expected but easy stroll to the cliffs from the National Trust car park. 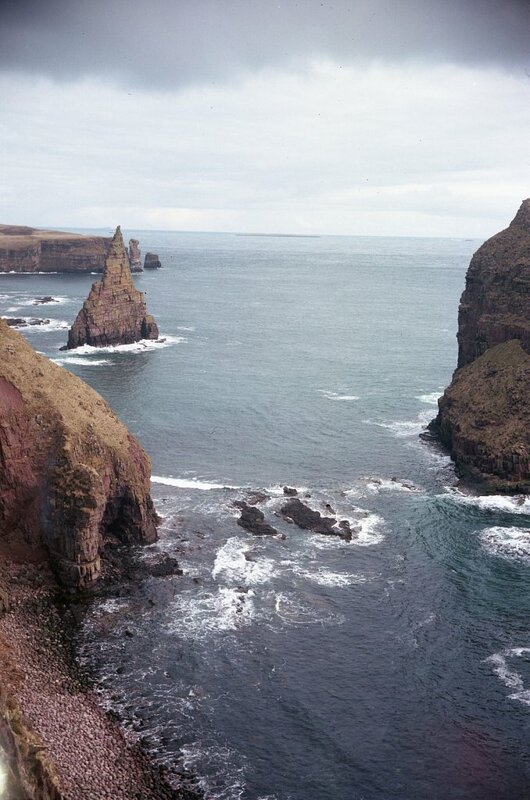 Upon arrival its quite striking to see the cliffs. They're common sights on Instagram and from the air the cliffs look like a big block of white cheese someone has been busy taking bites out of around the edges. Still cool sights to see from the top but not quite as impressive as seen from the sky. Reviewing these images I do wish I'd made use of my 10 stop ND filter - the texture of the rock would benefit from the sea being smoothed out. 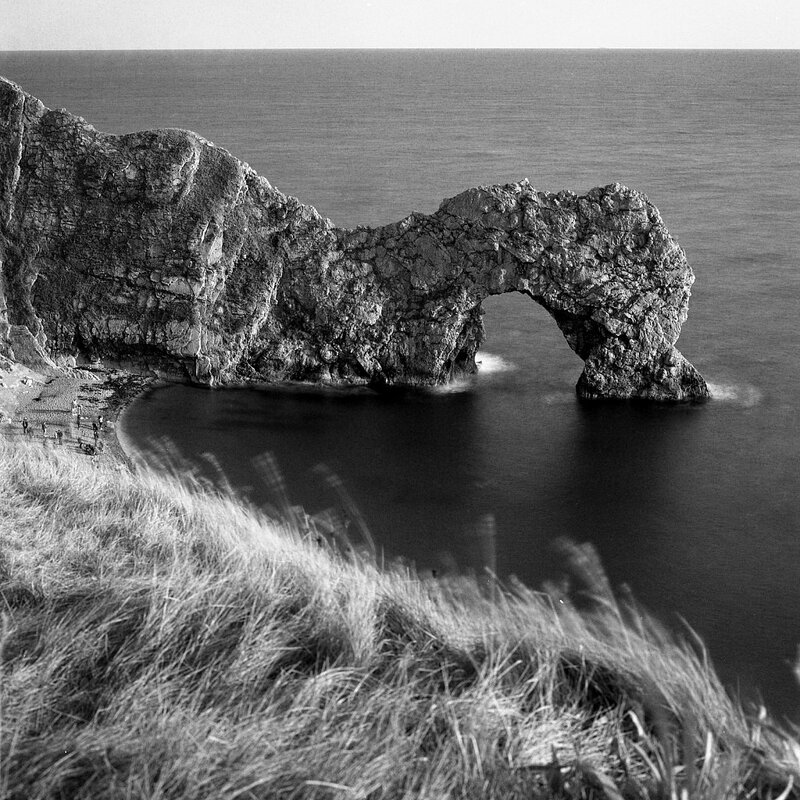 Next I proceeded on to Lulworth and the quintessential sight of Durdle Door. The village of Lulworth was the most picturesque traffic jam I've been in for a while. The old tiny streets straining to keep up with the numbers of tourists and busses passing through on a busy bank holiday weekend. Despite it being cold and very windy it was a surprise to see a large number of people of the beach down below by the arch. The sun was crawling lower in the late afternoon sky and I decided to stay up on the clifftop path to get my shots. The one at the top of this article is my clear favourite and makes use of the 10 stop B+W filter in my arsenal. I'm not really sure why I didn't use it for the two photos above also. 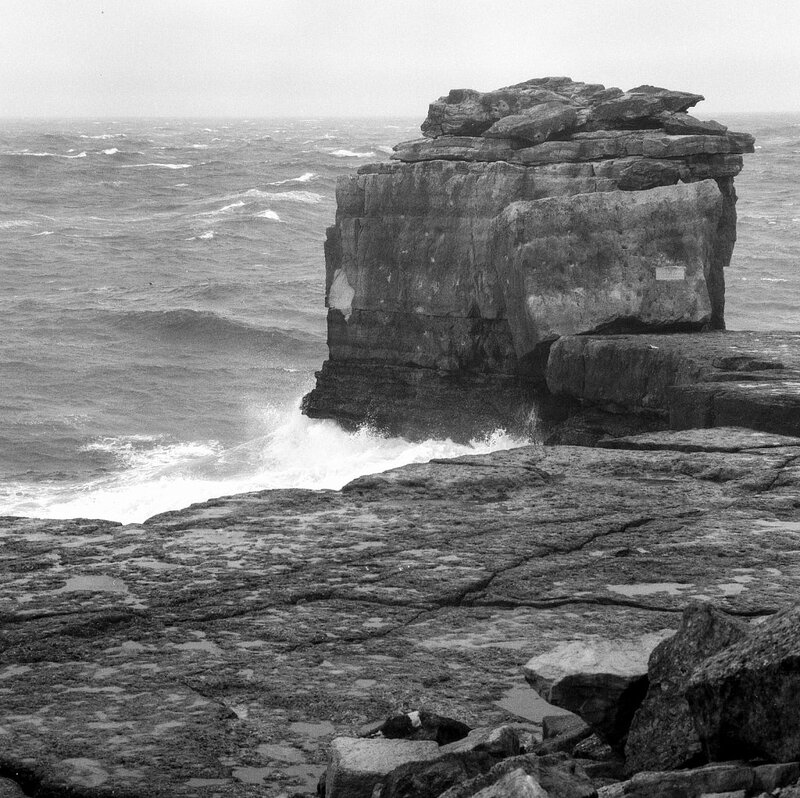 I finished up my photography on the trip with a visit to the Isle of Portland and Pulpit rock. The weather here was that of ferocious wind, so much so that even with my tripod a long exposure would suffer from significant shake. The tide was in and the waves were large and so didn't enable me to get any of the shots I'd envisioned. Despite not being anywhere near what I wanted the shot above still took a great deal of patience as people would stand by the rock for 10-15 minutes at a time taking selfies and so I had to time my shot whilst people were walking away. This was made even more challenging by the constant spray covering the lens. Overall a really great trip and a part of the world I'd definitely like to visit again with my camera! The Zeiss Ikon Ikonta 520/2 is a german made 6x9 camera that takes 8 frames on regular medium format 120 film. It was produced between 1929 and 1937 meaning that the model I acquired on eBay last year must be 80+ years old. My appreciation of Zeiss Ikon folding cameras was started when a a relative gave me an old 517 6x6 camera they found in the closet. It was in immaculate condition and my first time using 120 film - I was hooked, not only on medium format but also the compact size of these nifty folding cameras. I think it was on Reddit's analog channel that I saw an inspirational 6x9 image of the great wall of china taken with a folding camera which prompted intrigue for me to see what folding 6x9 cameras there were available on eBay. Mint condition Ikontas appeared to go for several hundred pounds, too much for me to try on a whim, but if I was willing to take a risk on one that looked pretty beat up it could be mine for a tenner. So I took the chance. Maybe the bellows would actually not have any light leaks after all? 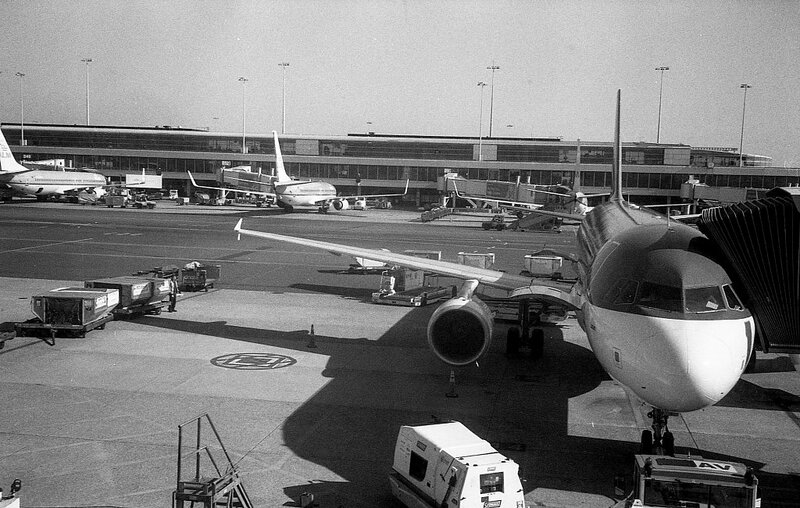 The first roll of film I put through this camera was interesting (see here) - it actually worked! I mainly took portraits of family, which broadly failed due to poor judgement focusing, but it was cool to see the sharpness of a landscape shot on the roll. 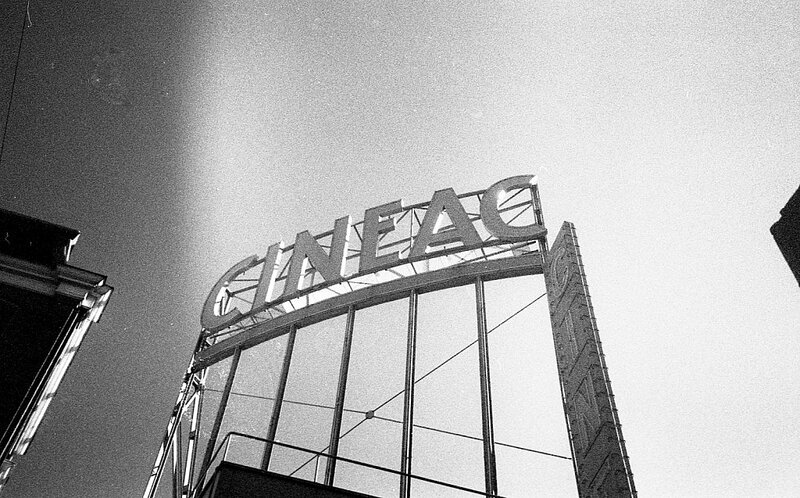 One thing I noticed from this test roll was a red light leak onto the film in the bottom corner. The 520/2 has a red window to view the frame number on the film backing, but unlike the later produced 517 I own it does not have a shutter window to close. I guessed this must have been the culprit and so deduced that the test roll was promising enough to try another roll through the camera and going forward I would tape some card over this red window in an attempt to limit the light through this hole. So this camera accompanied me on my Scotland road trip as a third camera. Getting the negatives back from the lab I was excited. The negs looked pretty well exposed in most cases and after scanning them in with my Epson v500 many were also pretty sharp too! The red light leak was diminished compared to previously, but still present on most images. As it was more pronounced on some images, and almost invisible on other, I guess that the time taken to take the shot after removing the camera from the leather case must have been an issue. A few shots appeared to be blurry due to camera shake. Although all shots were taken on a tripod with a cable release, the tripod mount on the camera is awkward - it needs an adapter to change a 3/8 inch thread to a standard 1/4. Then the tripod mount needs to be at 90 degrees to normal, otherwise the mount blocks the base plat of the bellows from folding out completely. The tripod mount screw does not go in all the way and left the camera a bit wobbly, which I guess must have been the reason. It was also likely exacerbated if I didn't use the maximum 1/100 shutter speed of the Telma shutter (this model has 100, 50 and 25th of a second settings along with bulb). 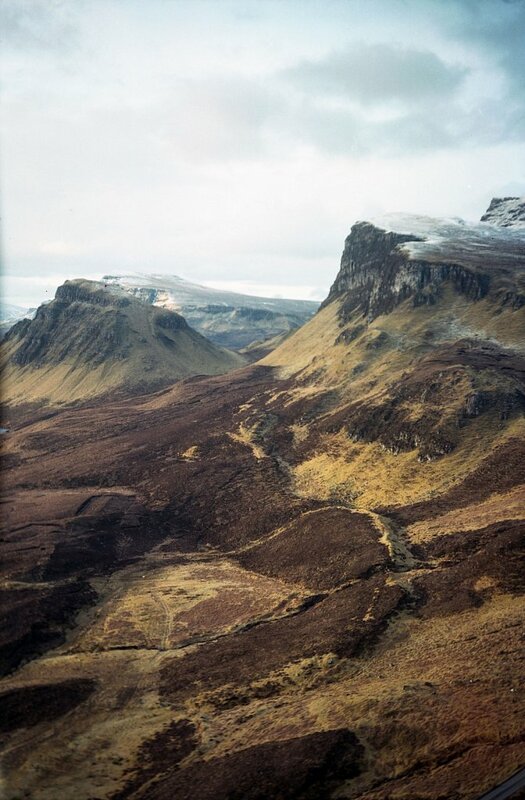 The example below shows this and also illustrates how it is somewhat had to frame the image with this camera. You have a small ground glass framing screen just above the lens of the camera. It was be hard to really get a good appreciation of how the framing is lining up. As can also be seen by the poor framing of the below image. So overall I like the 6x9 format, the convenience of the compact size and also the way that this 80+ year old camera is still working. Of the images in the roll I really like the the Quaraing shot (top) and its pretty remarkable a camera of this age can produce a shot like this today. I was lucky that the bellows on this camera don't appear to have any significant light leaks and although I need to research it more I wonder if the light leak from the red window is because the camera was designed for orthochromatic film (not sensitive to red light) and although covering the window is a good step, I just need to be more diligent in how long I have the camera out in the light. Trying old cameras and their quirks is one of the fun things about film photography and this certainly was no different to normal. It might be some time before this camera gets another roll and next time I think I'll try some low speed B+W film instead which should mitigate the impact of any light leaks. 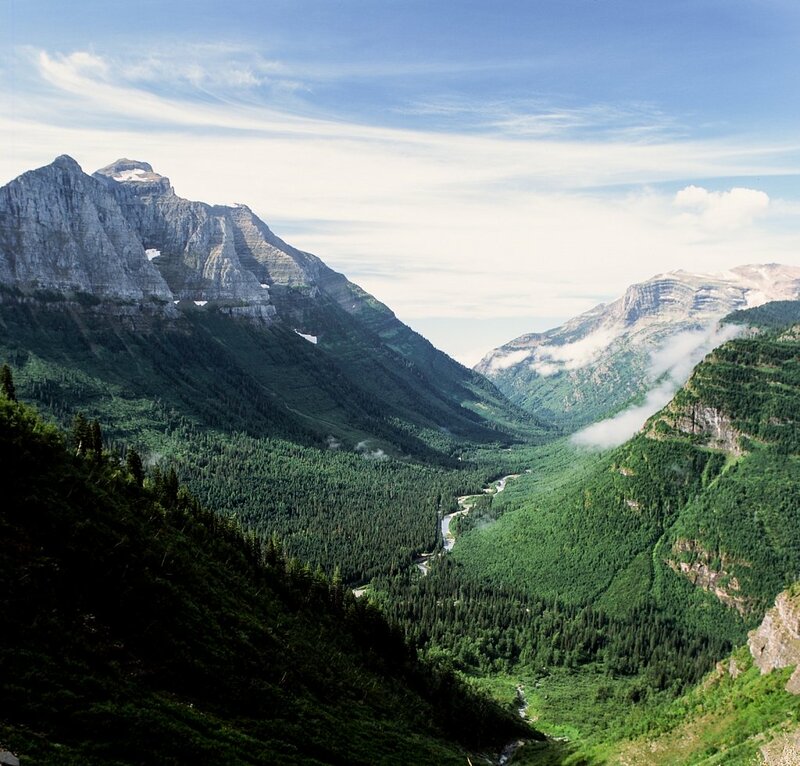 Two of my favourite trips were in 2014 when I visited Yellowstone and, a few months later, Glacier National Park. I took a ton of photography gear, but looking back I'm glad my Bronica accompanied me. I shot 3 rolls of Fuji Provia between these two trips, the first time I had shot slide film in 120 format, and so it was a bit of a gamble. I still was (and today still am) trying to master judging the optimal exposure with my Gossen incident meter. Shooting slide film was ambitious, and the narrow latitude indeed caught my exposure judgement lacking in more frames than I would have liked. However looking back at the images I'm struck by the intense vivid colours when I managed to get the exposure just about right. One day I would love to visit again! 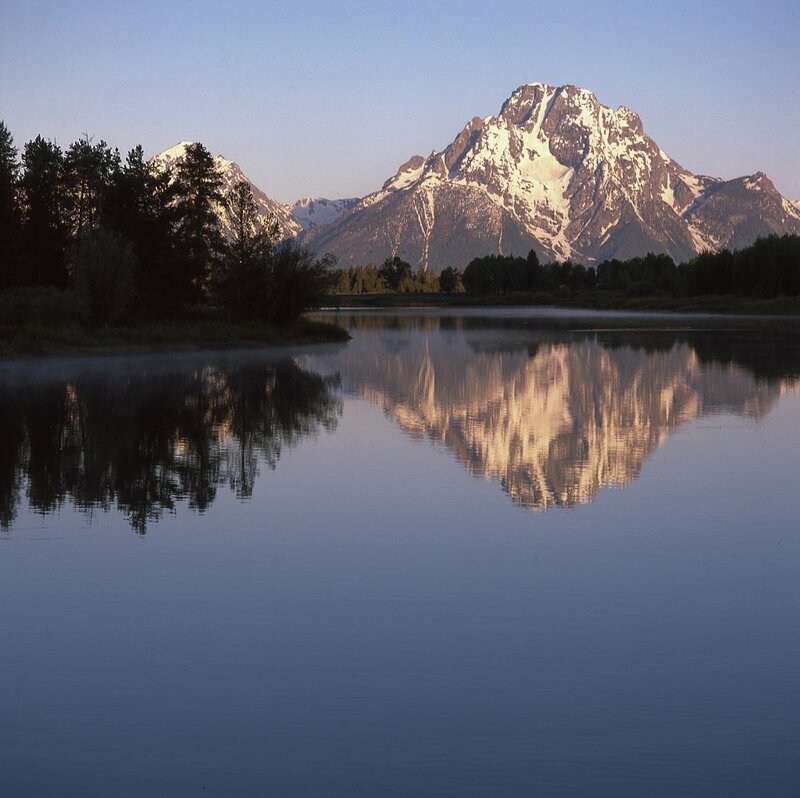 TetonWyoming, 2014. Bronica SQA + 150mm f3.5 + Fuji Provia 100. 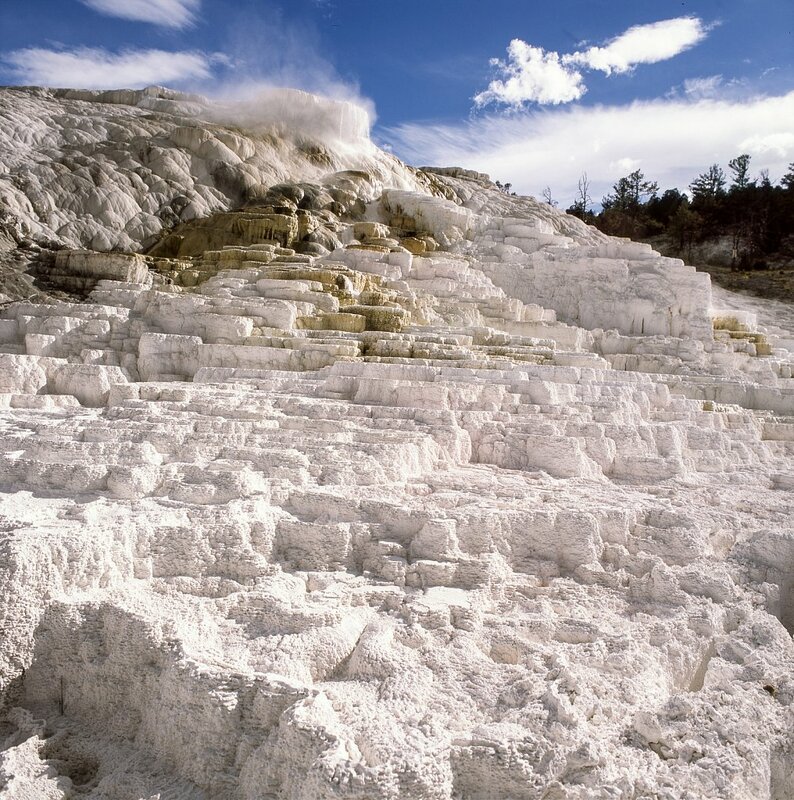 Mammoth Hot SpringsWyoming, 2014. Bronica SQA + 50mm f3.5 + Fuji Provia 100. 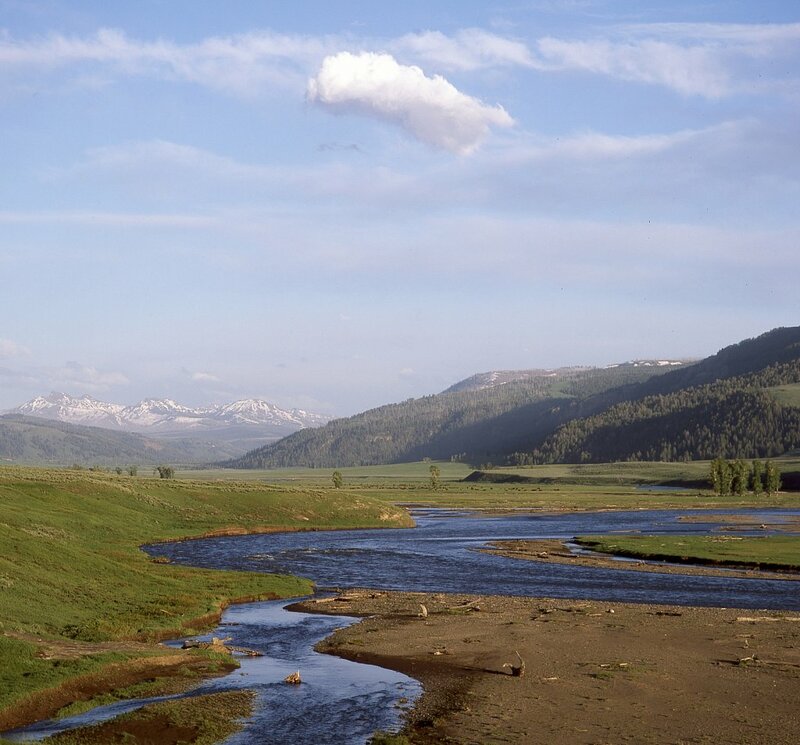 Lamar ValleyYellowstone (Wyoming), 2014. Bronica SQ-A + 50mm f3.5 + Fuji Provia. 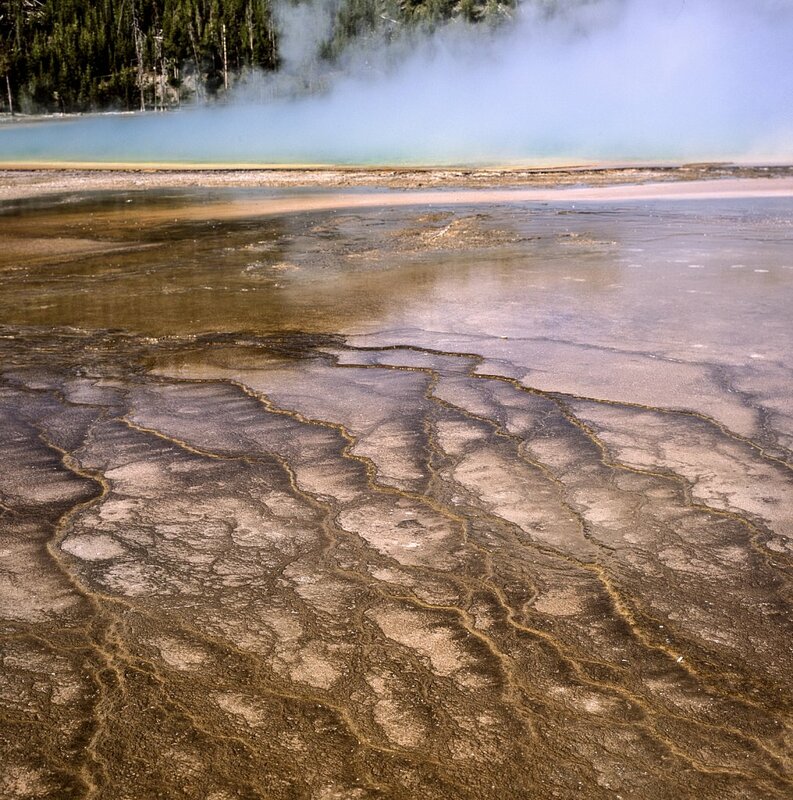 Grand PrismaticYellowstone (Wyoming), 2014. Bronica SQ-A + 50mm f3.5 + Fuji Provia. 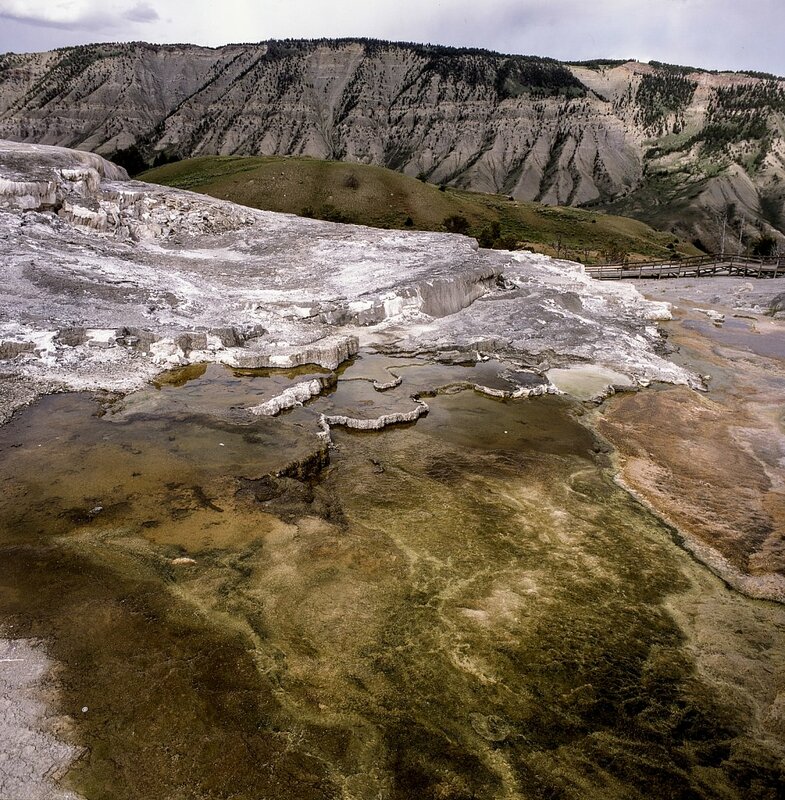 Mammoth Hot SpringsWyoming, 2014. Bronica SQA + 150mm f3.5 + Fuji Provia 100. Logan PassMontana, 2014. Bronica SQ-A + 50mm f3.5 + Fuji Provia. 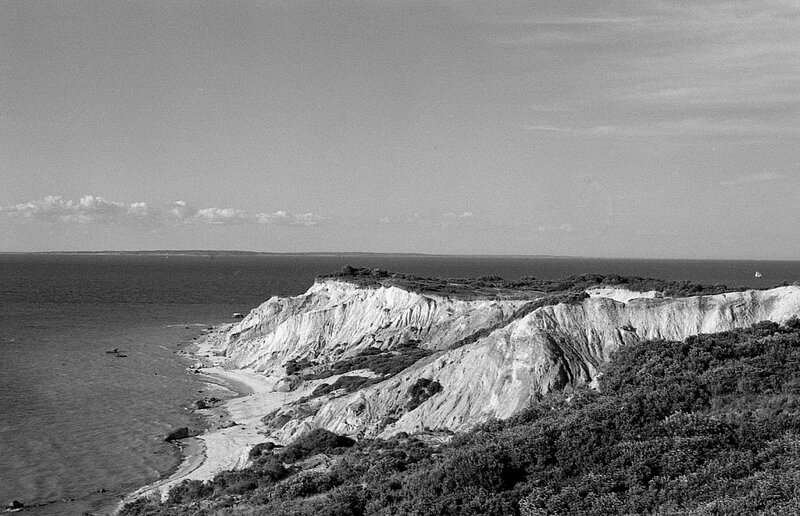 A short weekend trip to Martha's Vineyard after visiting NY resulted in less rain and even enough sun poking through the overcast sky to get burnt on the beach. East ChopNikon F3 + Series E 50mm + Kodak TMax 400. 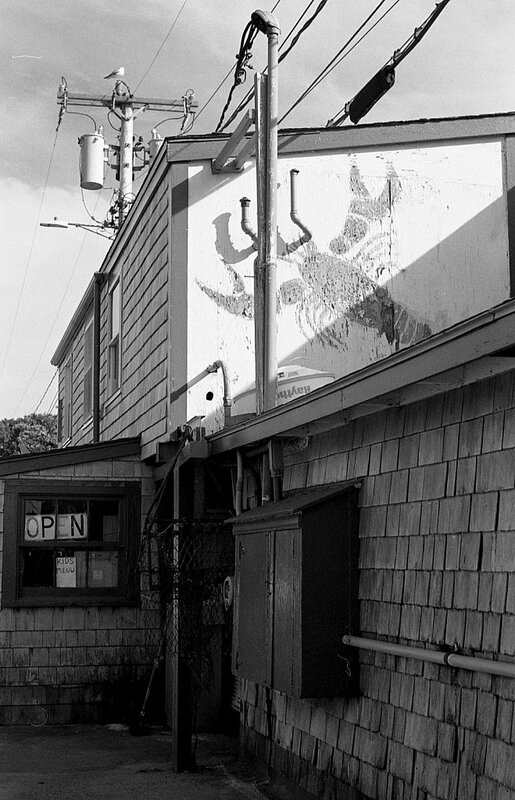 Menemsha Fish MarketNikon F3 + Series E 50mm + Kodak TMax 400. AquinnahNikon F3 + Series E 50mm + Kodak TMax 400. CharNikon F3 + Series E 50mm + Kodak TMax 400. 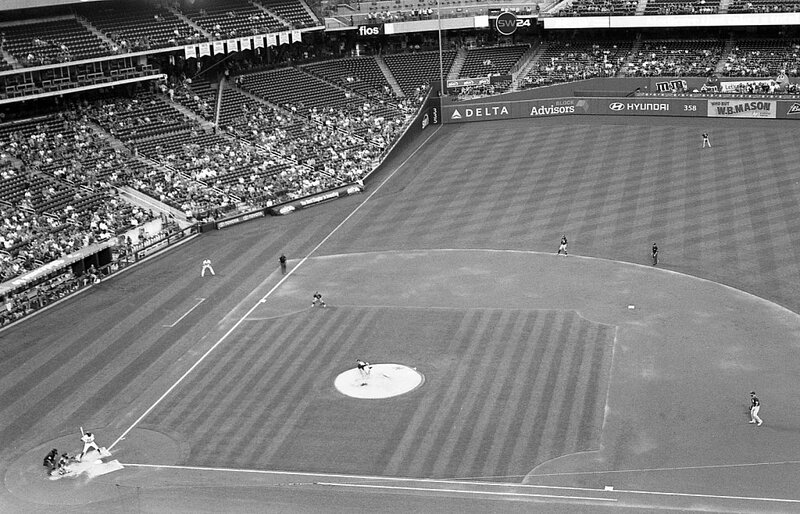 CitifieldNYC, 2018. Nikon F3 + Series E 50mm + Kodak TMax 400. 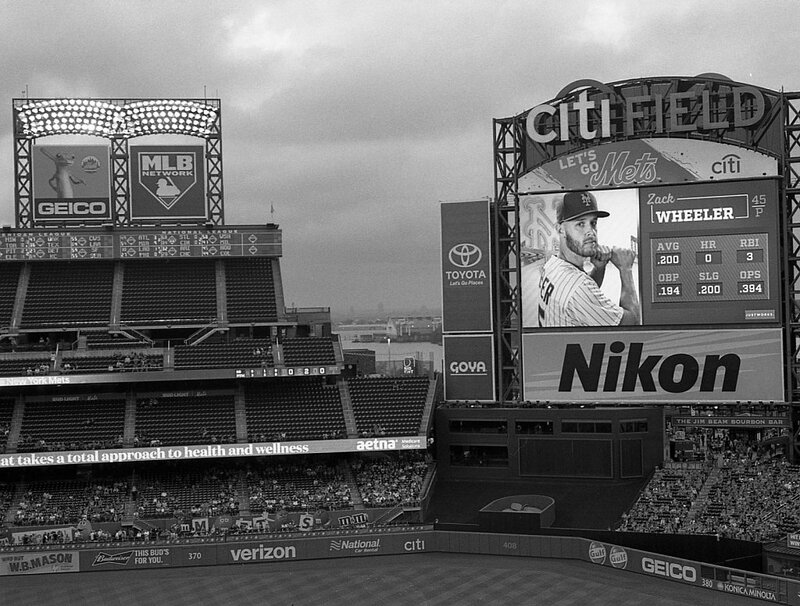 Padres v MetsNYC, 2018. Nikon F3 + Series E 50mm + Kodak TMax 400. 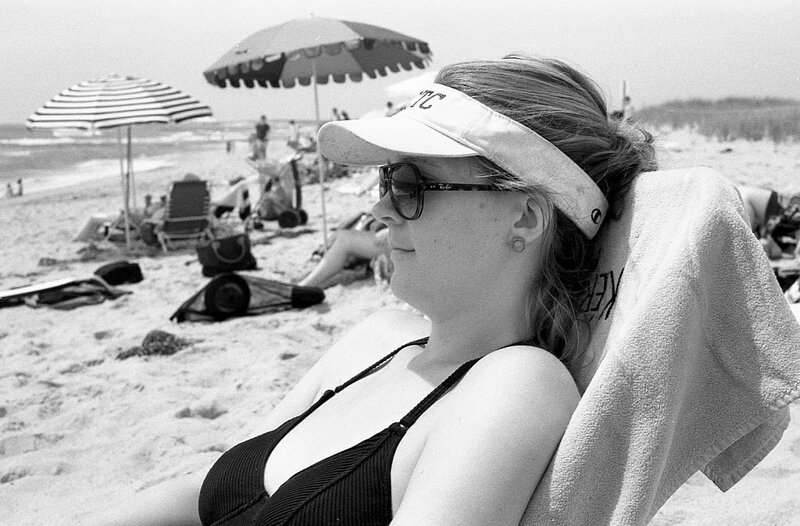 Accompanying me on a trip to NYC during July was my Nikon F3 loaded with some TMax 400. Despite living here for a couple of years and visiting numerous times since, there are still plenty of places I want to photograph here. I took the opportunity one evening to see the NY Mets beat the San Diego padres on one of the few dry evenings of the week. I'd seen a game here before and at that point I was interested in using a telephoto lens on my digital to get some images close to the action - I must have taken a couple hundred in machine gun mode. 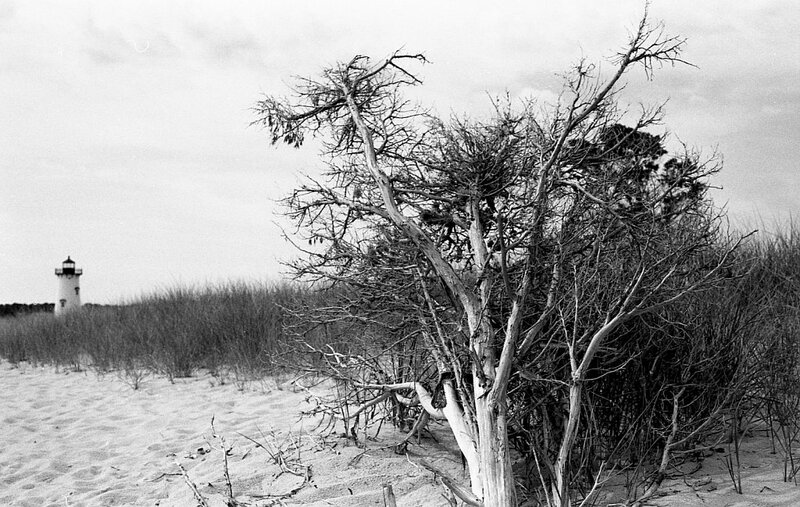 One of the things I like about using film is restraint in pressing the shutter. These two photos are enough for me to remember the occasion this time and I like how B&W brings out the texture in a very visually noisy stadium of brightly coloured advertisements. Both were shot with the 50mm series E lens but next time a wide and tele lens would also be fun to take. Fulton Center ExteriorNYC, 2018. Nikon F3 + 20mm f4 + Kodak TMax 400. Fulton CenterNYC, 2018. Nikon F3 + 20mm f4 + Kodak TMax 400. 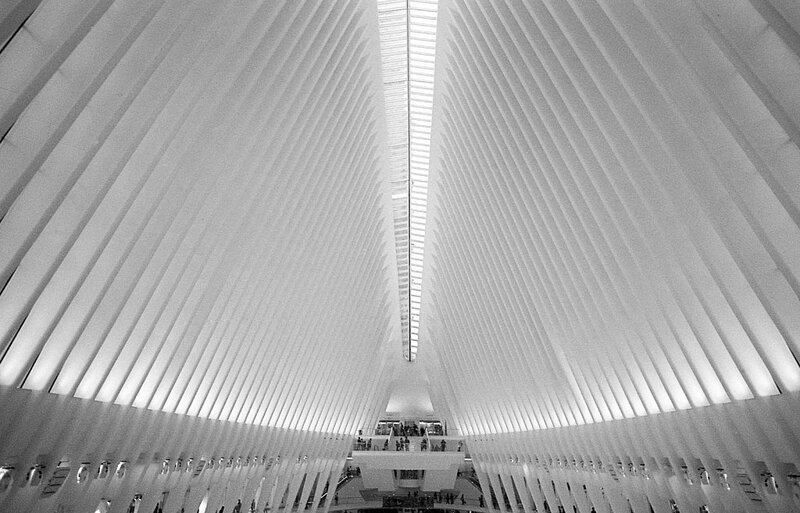 The Fulton center was opened after I moved away from the city and hadn't visited since. 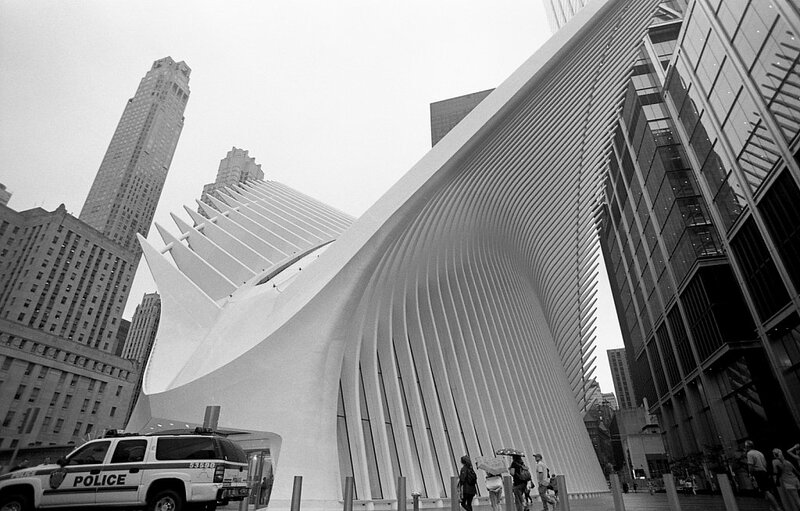 I was keen to check out its distinctive architecture and scout out photographic opportunities. The bottom shot is about a stop underexposed from where I wanted it; as the day was so overcast I was actually struggling to get a decent f-stop and shutter speed to use on the Nikon 20mm f4 lens, which needs to be stopped down well for sharpness. Outside (top shot) was better - only a 1/3rd stop underexposed and I increased contrast and black levels a bit in Lightroom before export. 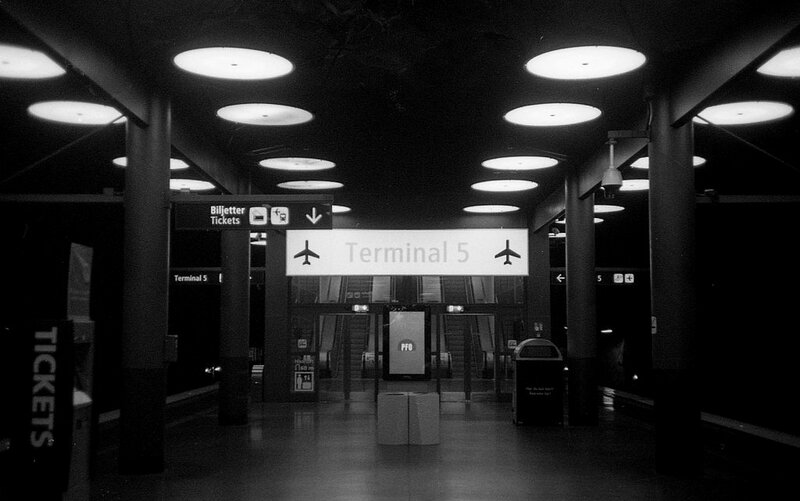 This is a common theme for me with the F3 and I should really increase the exposure compensation I use by default with TMax 400. FlatironNYC, 2018. Nikon F3 + 20mm f4 + Kodak TMax 400. I quite like this last shot, even if it suffers from being a bit cluttered and with the hot dog seller being in more of a shadow than I'd like. 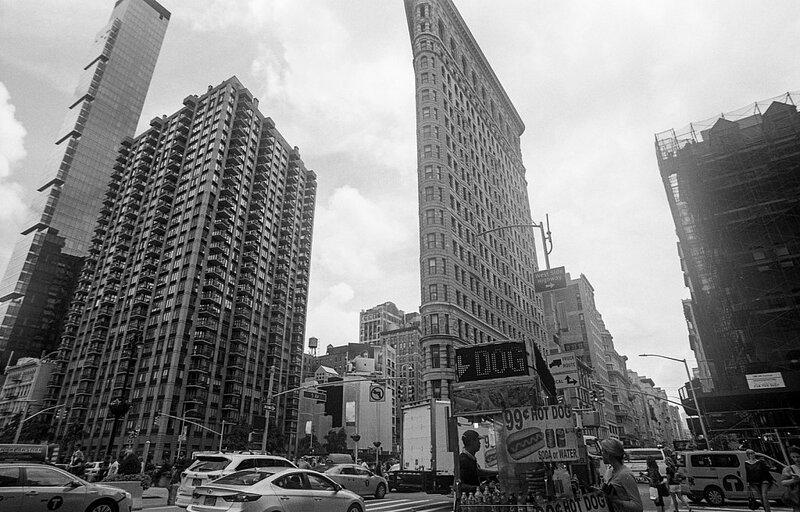 I've tried many times now to photograph the Flatiron building as a backdrop for some street photography and never quite been able to get the shot I wanted. With this one its clear I should've got close to the hot dog stand to feature that more prominently in the foreground! 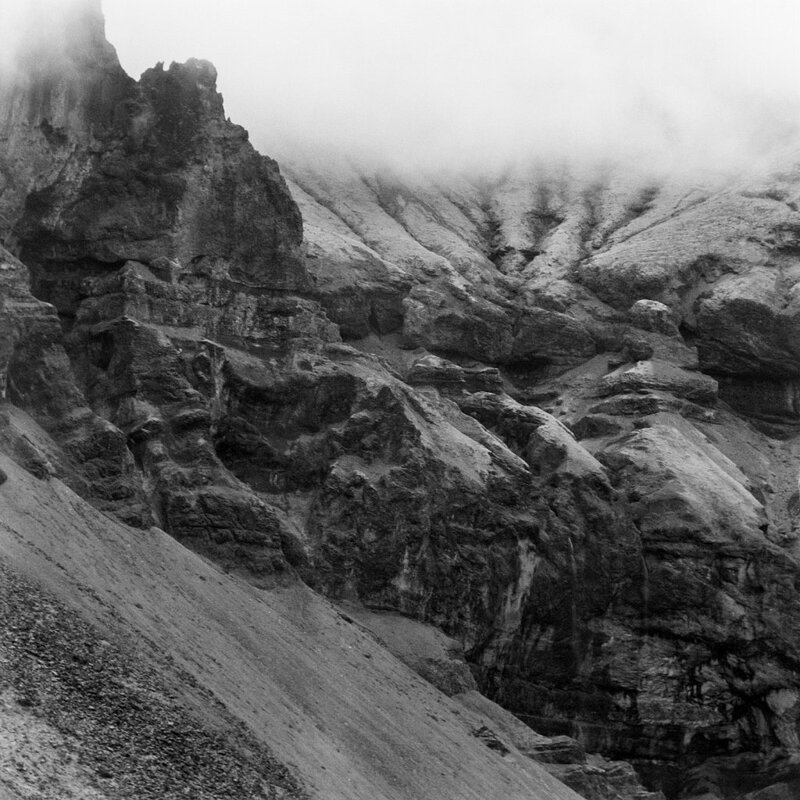 Mountain DetailIceland, 2018. Bronica SQA + 250mm f5.6 + 2x TC + Kodak TMax 100. Exposure 1/4 f8. It was a bit of an impulse purchase to get the 2x TC for my Bronica SQ. It was a few weeks before I departed for Iceland and given how useful I had found the 250mm f5.6 lens I impulse bought for my Scotland trip a few months prior, I convinced myself it would be worth seeing if 500mm would be a useful focal length to pick out detail in Iceland's landscapes. Before picking up this lens I couldn't find any really useful sample images online for this combination, so hopefully this post will help someone in a similar position in the future. In theory, yes, having a focal length of 500mm on a 6x6 Bronica (approx 321mm 35mm equivalent) is very useful. Traveling Iceland via the main highway 1 there are plenty of places to stop where there are some interesting mountains and waterfalls far in the distance. This focal length will enable you to get some pretty unique shots. However here comes the rub; the practicalities of using this 2x TC on the 250mm f5.6 Zenzanon lens make it difficult to get the clarity and sharpness you might be used to with this 6x6 medium format camera. For a start the effective aperture wide open (f5.6 on the lens) becomes f11 as you lose two stops of light. The focussing screen is surprisingly bright though, and if you're focusing at infinity anyway, that isn't such a big deal. It does however mean you'll probably be using a slow shutter speed making the sharpness of the final image incredibly vulnerable to vibrations, be it from even the slightest amount of wind, or even from the significant mirror slap from the bronica itself. Obviously the latter can be mitigated by using the mirror lock up mode, which I did, but even with a pretty sturdy Giottos tripod the wind definitely had an effect. The TC + 250mm combo is huge and has plenty of surface area for the wind to catch. All of the practical considerations described above are in addition the the fact that using the TC degrades sharpness even in perfect conditions. Frankly its hard to differentiate the two factors with my images; there was always at least a bit of wind present and even though I took every reasonable precaution to minimise the effects of wind this will still have been a factor. The other concerning thing was that the TC actually got jammed onto the 250mm lens. 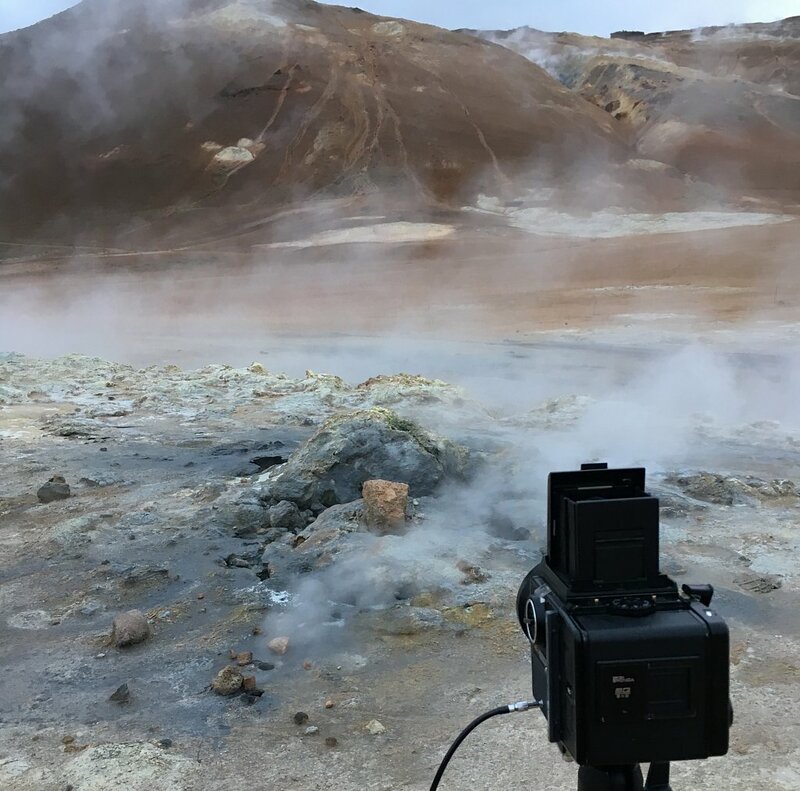 It was a source of frustration at the time, trying to remedy the issue on top of the ridge around the Krafla crater, but eventually I prised it free with a metal key and some brute force applied to the lens release slider. The images displayed here all demonstrate the sharpness issues that I refer to above. Is this acceptable to me? Kind-of. The final image was really disappointing, potentially there was more wind here influencing the sharpness, but the first two are OK. Yes I do think the softness in the image reduces their impact but then again the TC was crucial in framing these shots. To be honest I'll be thinking twice before taking this TC with me on a trip again. Its heavy, bulky and with the loss in image quality it might be worth thinking of using alternate compositions with the 250mm on its own, cropping down, or in fact using a 35mm camera with a 300mm lens instead. 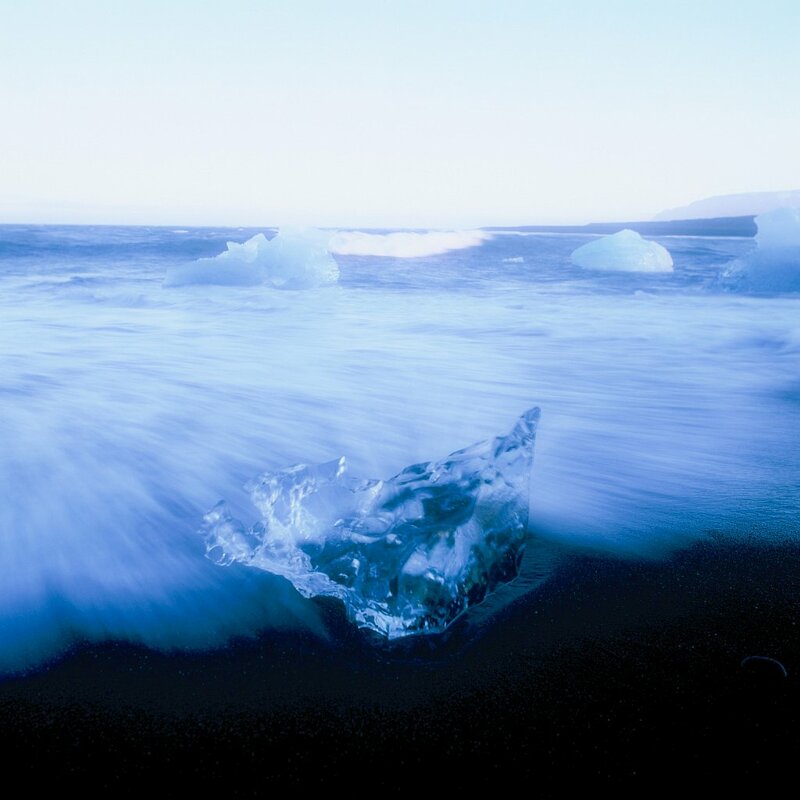 Jökulsárlón ShapesIcleand, 2018. Bronica SQA + 250mm f5.6 + 2x TC + Kodak TMax 100. Exposure 1/60 f8. Here are five images I particularly enjoy from my first visit to Iceland. All are taken with my Bronica SQ-A and Kodak Portra 400. You can see more in the full album here. The sun is still bright in the sky with some gorgeous colours starting to come out at 9.30pm in Icleand and for the next hour or so I played a game of dodge the waves as I set up my tripod, tried to focus, and run back before the next wave got my trainers wet. When I first got this shot back I was disappointed that the focus was off and the ice block wasn't in razor sharp focus. As time has passed I've come to appreciate this photograph more because of the lack of sharpness - its precisely this, along with the cool colours of sunset, that give this image a dream-like character to me. When I saw this rock crawling out of the Reynisfjara black sand beach I was immediately reminded of this shot from Cornwall that I really enjoy. Although the colour palettes are completely different, in contrast to the first image, its the detail and sharpness of the image that pleases my eye. 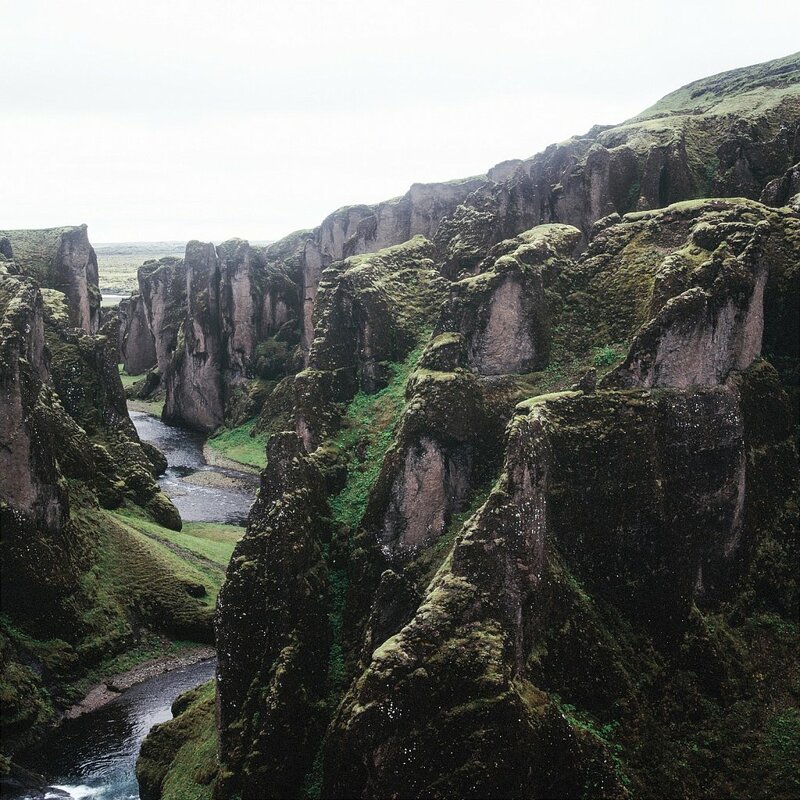 Fjaðrárgljúfur canyon is a remarkable place with many photo angles. The classic view of the river down the centre is cool, but in this shot I decided to try something more subtle. With the river positioned off left it draws my eye to focus first on the texture of the canyon walls. Here is one of the few 'classic' Iceland shots I captured during the trip. I was at the location at the perfect time and with weather that cooperated. I just hoped I had the exposure right as I only took a couple of frames here! I'm pleased with how it turned out, and the portra 400 does a good job of capturing the tonal variations of the disappearing sun. One objective I had for the trip, perhaps ambitiously, was to capture a puffin with the Bronica. 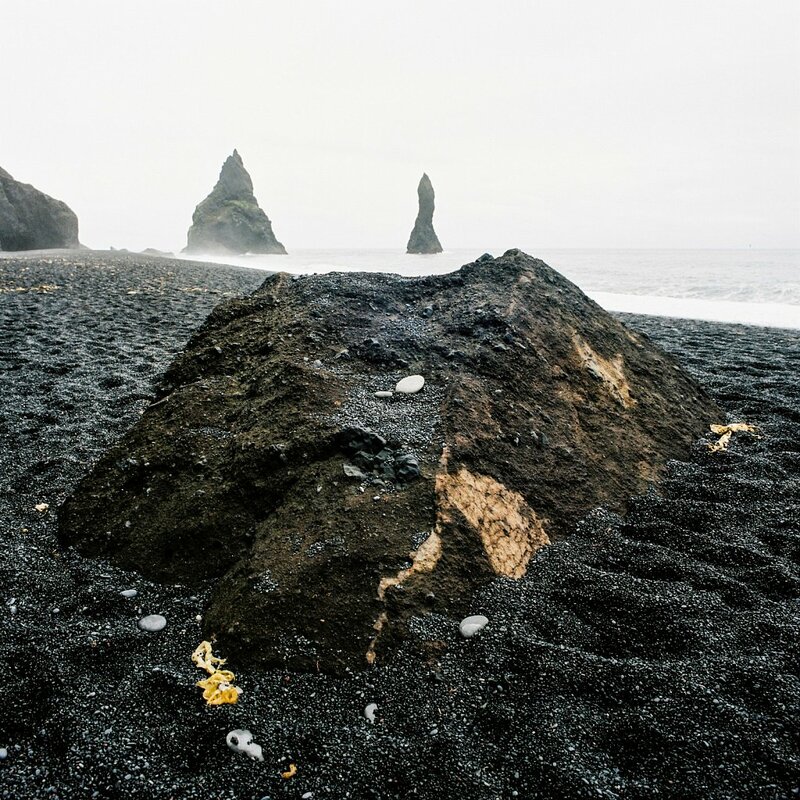 When one was swept up onto Reynisfjara beach I couldn't believe my luck. The little puffin was happy just chilling on the beach for around 20 minutes, giving my ample time to set up my Bronica with the 250mm lens to get this shot. Its fair to say Iceland has been high on my list for places to visit for some time. 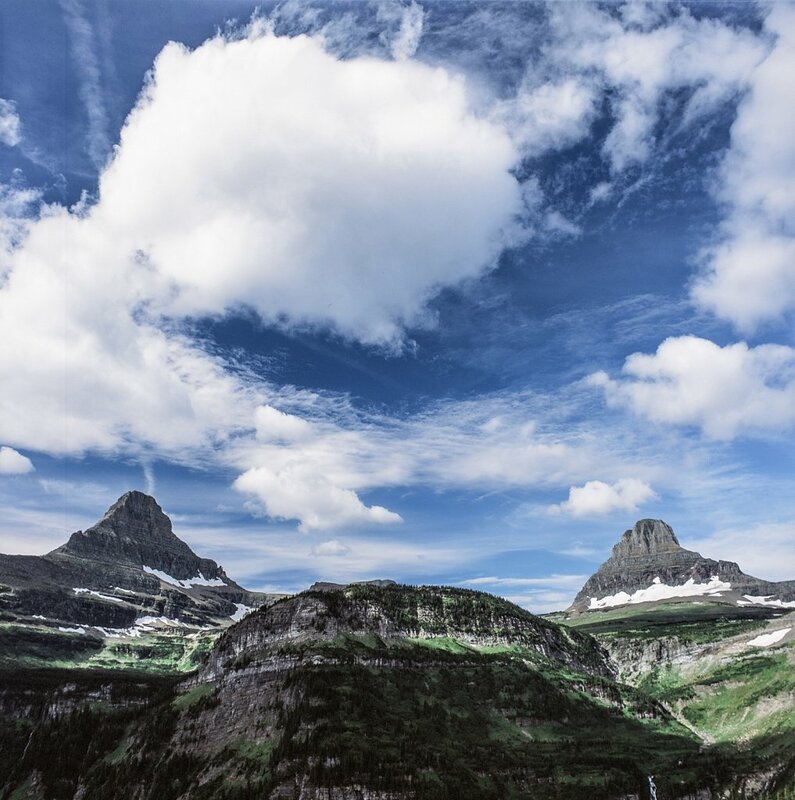 Its mystical landscapes of towering waterfalls and looming mountains seem ever present on landscape photography websites, particularly Instagram. So I decided to embark on a solo photography trip here, with the aim of seeing the main sites around the island in a mere 5 days of travelling. To save costs I would be camping each night except for the final night before my flight home. As I would be traveling solo with only short (< 2 mile) hikes to viewpoints I decided to take what some might describe as an excessive amount of camera gear. I've been really enjoying using my Bronica SQ recently for landscapes and so taking this was a no-brainer along with a full compliment of lenses (50, 80, 150, 250 and a 2x TC). I'd bought the 250mm on a bit of a whim for my last Scotland trip, and I was very happy with its results, so I'd decided to purchase the 2x TC to get me to 500mm in the hope that I may be able to capture some Puffin shots with it. As projecting 35mm slides is something I've been really enjoying recently I also took my Nikon F5 loaded with Provia 100 and shared lenses with my D7100 DSLR (20mm Ai, 35mm AFD, 50mm AFD 80-200mm AFD and a Tokina 11-16). The day started badly. Luton Airport appears to be one of the worst one can fly from, stretched for capacity and a with constant glut of passengers travelling on 'low-cost' airlines, which almost proved to be a terrible false economy for myself at least. Despite arriving quite early by taxi from north London at 5am there was already a traffic jam to get to the drop off section. Once inside the lines to check bags was like nothing I'd ever seen in any airport, in any continent, with the line snaking around the cramped airport like an anaconda. Thanks to the heroics of one Easyjet employee in opening a dedicated lane for the soon to be departing Iceland flight I did somehow get onto the flight. Landing in KEF airport one tip is to make use of the large duty free supermarket in arrivals, that is if you require any alcohol for your trip, as you will otherwise need to find a government run liquor store. After taking advantage of this I went to pick up my rental car which I'd booked online as a Suzuki Jimny 4x4. 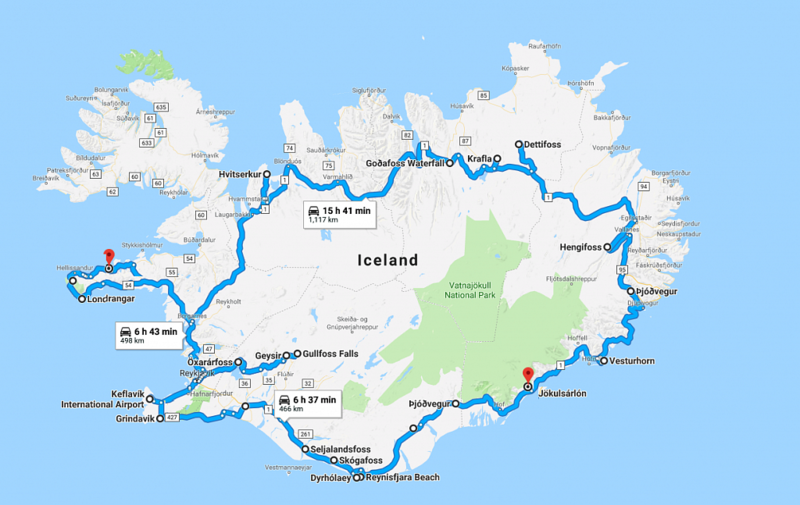 You might not need a 4x4 in Iceland, particularly in Summer if you do not plan to deviate from the main 1 highway, but I definitely wanted a vehicle with some decent ground clearance to navigate the potentially pot hole filled gravel tracks to some of the more remote locations I wanted to visit (e.g. Dettifoss). I didn't really have time to venture inland on the F roads which turned out to be a good thing. A free "upgrade" to a Dacia Duster which is a 4x4 greeted me with plenty of signs saying "this vehicle is not suitable for F roads - do not drive there - subject to heavy fines" in large lettering. I'd also been told that car rental companies in Iceland were pretty militant when it came to assessing damage to the vehicle upon return. I elected for the full insurance to alleviate any worries of chipped windscreens let alone anything worse. Starting the trip I went straight from the airport into Keflavik to stock up on my food supplies for the week. Sticking to budget food (think pot noodles, tinned fish, cheese and bread) it wasn't too expensive - I might have spent less than £100 on food for 5 days. Bonus is the "cheap" supermarket in Iceland. After picking up a camping gas canister from a N1 Petrol station I was now fully stocked for the week ahead camping. Making sure to keep to the relatively slow (by UK standards) speed limit of 90 km/h I commenced the journey, passing the power station that creates the famous "Blue Lagoon" and thinking I'd stop here on my return journey (a mistake as I did not end up with time). Its certainly a pretty surreal looking power station, something that wouldn't look out of place in a sci-fi movie, and I think there is some good photographic potential here. There's always next time I suppose. Then I travelled onwards around the coastal road towards the first waterfall of my trip, Seljalandsfoss. After a pretty uneventful drive seeing this 60m high falls is definitely pretty exciting. It was also an eye opener to the number of tourists that would be experiencing this too, the coastal route here was pretty empty, but on the main Route 1 rental cars were ever present and needless to say the car park was pretty full. This is a cool waterfall as there is a walking track behind it which is a pretty unique experience in Iceland. For photography its a little hard to capture due to the number of people around and also that they have roped off the slopes next to the waterfall, preventing you from framing some of the classic compositions of this shot. Next for waterfall number 2 - Skogafoss! I found this one a bit more impressive. Its height is the same as Seljalandsfoss but its far wider and powerful. I spent some time photographing at its base although its really hard to get a composition without any other tourists in it. I then proceeded to climb the steep staircase to a viewing point at the top of the falls. This was cool to see, but what I did not expect was a walking track along the upper river that fed the falls. I spent close to an hour up here capturing the meanders in the river and was actually a highlight of the day from a photography perspective. Proceeding further along Route 1 the rain began and the overcast sky became dimmer. I reached Vik and set up my tent in the pouring down road with windy gusts bringing chills to my body. As I thought about the sunny 30 degree heat my home in England was having it must be said that I did ask myself what I was doing here. The sleeping mask and shot of jack daniels before bed combination appeared to did wonders in assisting me to sleep through the midnight sun. The weather in Vik was still pretty miserable and I left my tent to pack up later. I retraced yesterdays journey 20 minutes and turned off to Reynisfjara - the Black Sand Beach with towering hexagonal basalt columns. The light was overcast and indistinct. Although arriving at 8am I hadn't managed to get to the beach as early as I had wanted I was still the second car to arrive so I pretty much had the whole beach to myself for around 30 minutes before the other visitors started multiplying. There were plenty of composition options, obviously the basalt columns you will see as you arrive, but also further down the beach with the ominous looming stacks in the sea towards the far end of the beach. As I was walking back an unexpected surprise occurred. 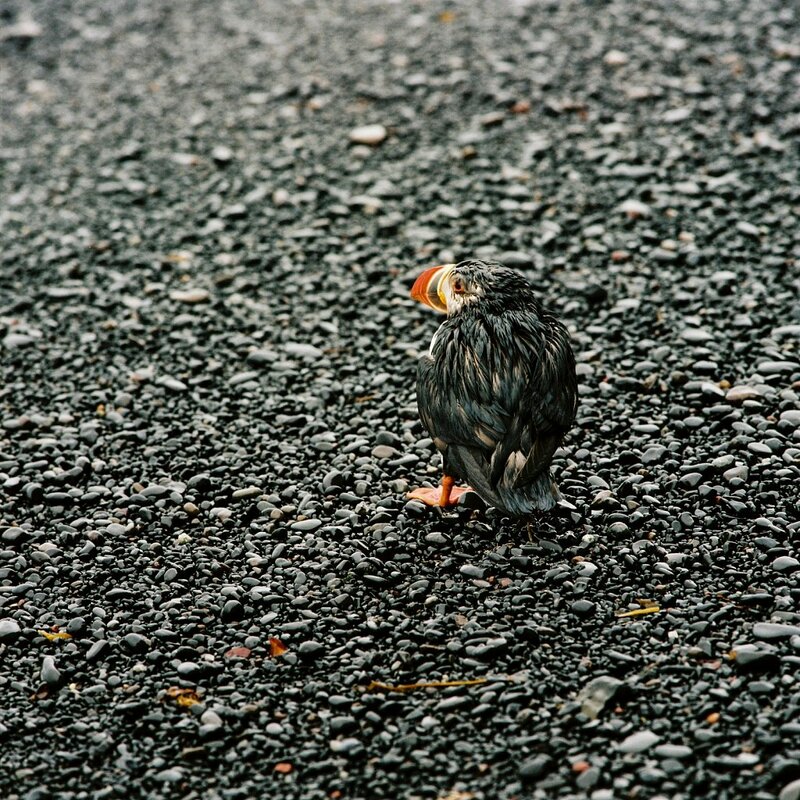 A small Puffin, looking absolutely exhausted, washed up onto the beach and calmly stood recovering some energy. 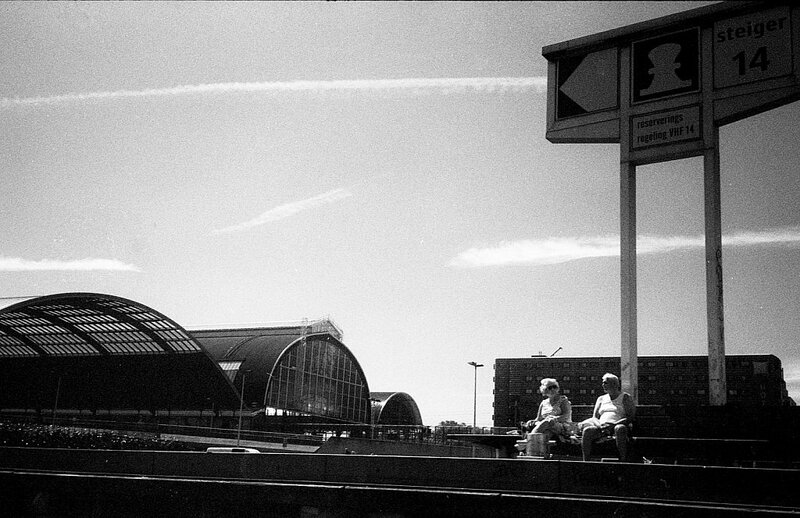 It stayed for some time allowing me to capture a number of shots on the Bronica and digitally also. A short drive away from the beach is Dyrhólaey, a clifftop refuge for many nesting Puffins. It also offers great viewpoints back onto Reynisfjara and cliffs the other side. One of my favourite shots taken here is of an incredible basalt arch that looks like the spiny tail of a jurrassic age dinosaur. Proceeding onwards into marginally better weather I arrived at the epic Fjaðrárgljúfur canyon. The jagged sides to this crevasse are a sight to behold. This area shows signs of the impact of increasing tourist footfall, the soil is very compacted now and many of the old cliff edge viewpoints are roped off and workers use garden forks to air-ate the soil in an effort to encourage grass to reappear. A moderate hike to a viewing platform built above the canyon offers a great lookback and also a charming waterfall. This is cool but bad for tripod photography. The metal platform is cross hatched and so it is hard to find a configuration for the tripod legs to not slip through. In addition people walking will vibrate the platform that slow shutter speeds would likely be blurry. After a good amount of time here I went to leave the small car park. However a large camper van had managed to drive itself into a ditch and had got itself stuck, precariously tipping to the side. Parked cars on the other side of the narrow lane left very little margin to pass between. After 20 minutes of deliberation a 4x4 eked it through the gap. I thought I may as well try my luck and did manage to pull through thankfully. It could have been a long wait to get the camper towed out. Next stop Skaftafell, a large national park, with glaciers easily accessed from the route 1. There is a viewpoint by the road but driving around 20 minutes down a pot-hole strewn dirt road will bring you right upto the head of a glacier. The texture of the fissures in the ice gives plenty of photographic opportunities. The weather though didn't cooperate and after only 45 minutes here I had to retreat back to my car. The final stop of the day would be the "Iceberg Lake" Jökulsárlón. 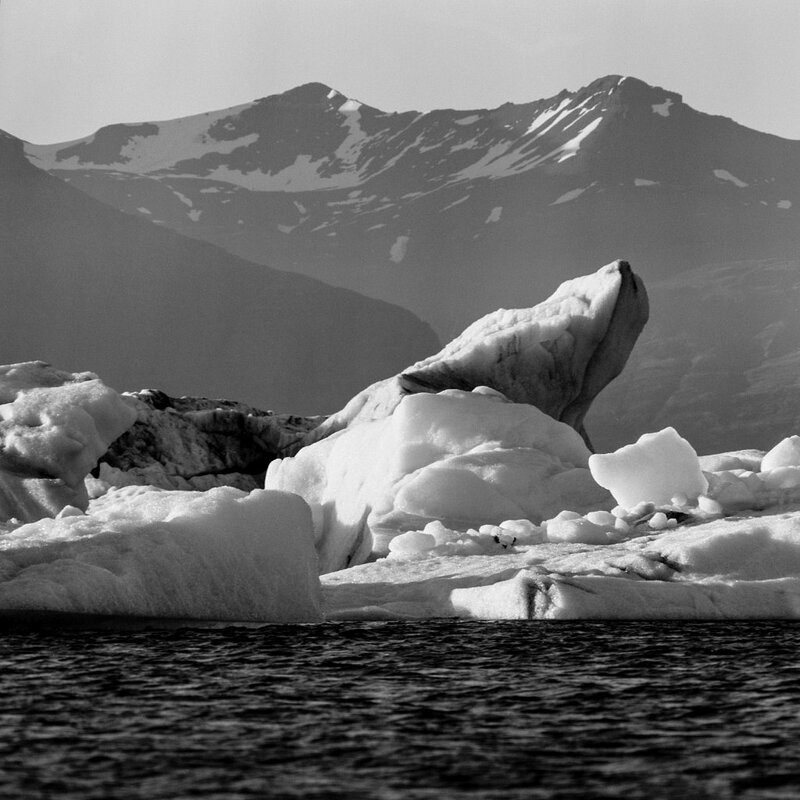 Huge chunks of glacial ice break off and into the lagoon, eventually to float out to sea. I arrived around 9pm - the sky had cleared out to a fine blue and the sun was glorious. A telephoto lens is recommended here in order to focus in on the structural details of the icebergs which you can photographs from both sides of the single track bridge. Once you are content here you can cross the road to the beach where the tide washes back many pieces of ice to the beach making for some great compositions of the waves crashing in on top of them. Wellies would have been very welcome to photograph here. Instead I spent my time running back from the camera as the waves came in! The campsite at Hofn is really close to my early morning destination of Vestrahorn which I am led to believe is a very photogenic place from all of the incredible photos readily available online. Unfortunately a thick blanket of cloud prevented me from even seeing the mountains the other side of the bay. The towering black sand dunes peppered with grass however were still very fun to photograph. Sometimes its the subtle subjects that I appreciate the most. 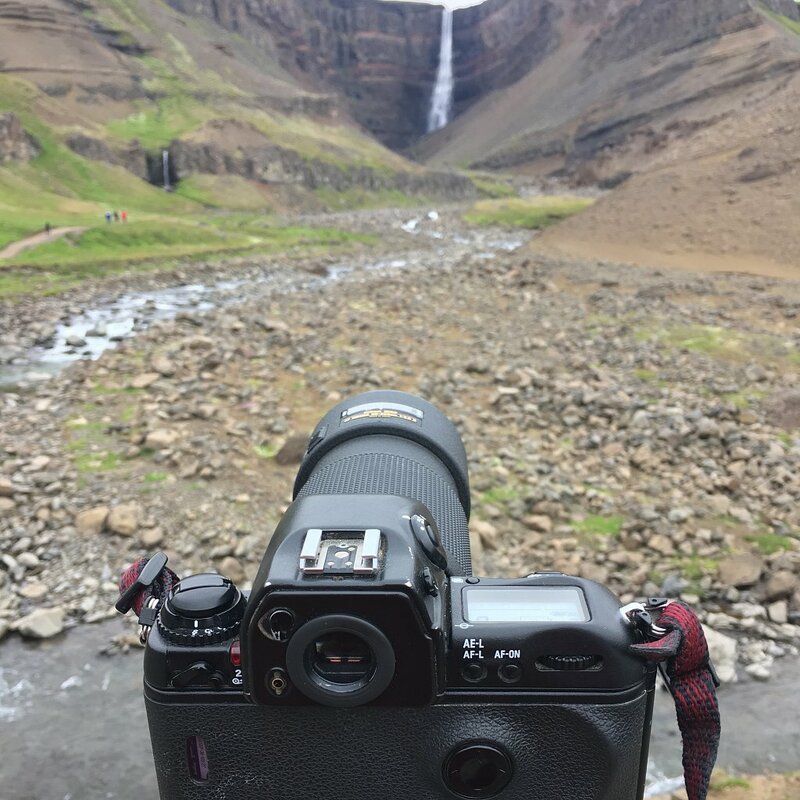 After returning to pack up my tent I proceeded on a 3 hour drive to Hengifoss, stopping along the way for a few more waterfall shots. I took a dirt road shortcut away from Highway 1 which did not live up to the strong warnings my Lonely planet guidebook proclaimed. It was an easy, if foggy and muddy ride. My white Dacia Duster was completely brown by the time I reached Hengifoss. Its around a 45 minute hike to Hengifoss which is one of Iceland's highest falls. Its colourful rock face is a nice backdrop to the waterfall. Litlanesfoss is on the way and spectacularly pours out from an opening of majestic basalt columns. Despite drones being banned at many sights in Iceland, there was one being flown as I photographed Litlanesfoss. I guess it had been put onto an autopilot mode to circle around a proposing guy and his soon-to-be fiancee. Me, with my attention to my Bronica, did not immediately notice the low height and incoming trajectory of this drone and it came very close to making an acquaintance with my head. It was another significant drive then on to Dettifoss. After turning from route one it took around an hour on a dirt road to arrive at the parking area. This waterfall has the most volume of any in Europe and it was easily my favourite of the trip. I first proceeded past and hiked over to Selfoss which is the upper gorge before Dettifoss and is lined by waterfalls from the river above. It was an incredibly impressive sight, despite the poor light and intermittent rain. Although it didn't feel like it, the night was drawing in. I drove on to the lake at Myvatn to a fantastic campsite there right by the lake but made a stop in the geothermal area just before. 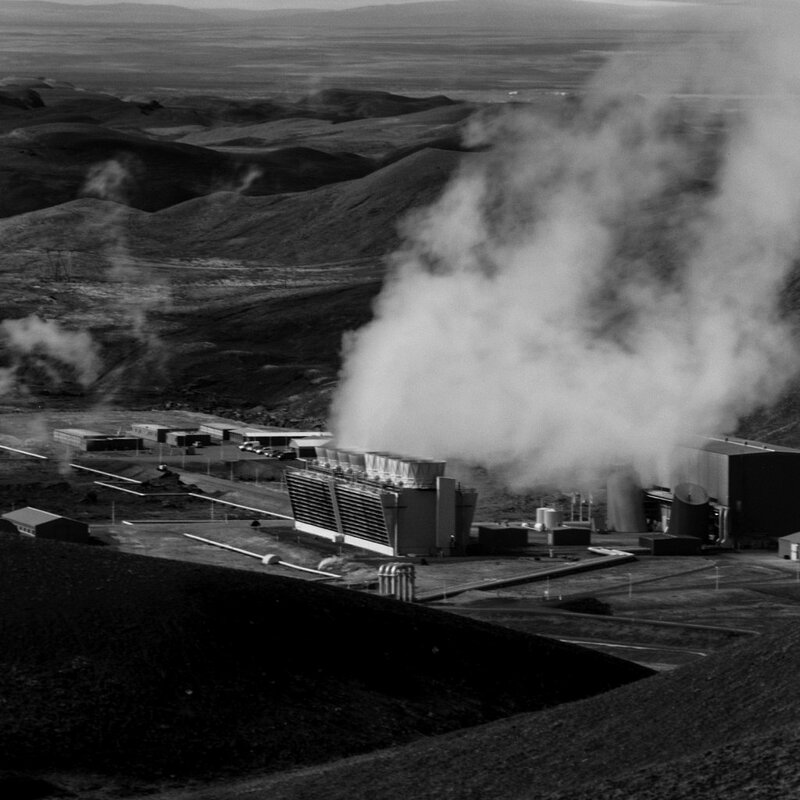 It felt pretty eerie to be standing in the midnight sun with the geothermal steam drifting up out of the ground. The morning saw me head upto Krafla a giant volcanic crater near the Myvatn lake. The road there passes a geothermal plant that would make a great backdrop for a 70s sci-fi movie. I headed up the crater rim and decided to get some detail shots with my 250mm lens on the Bronica. I also tried my 2x TC on this lens to get some images of the power plant and some nearby mountains. 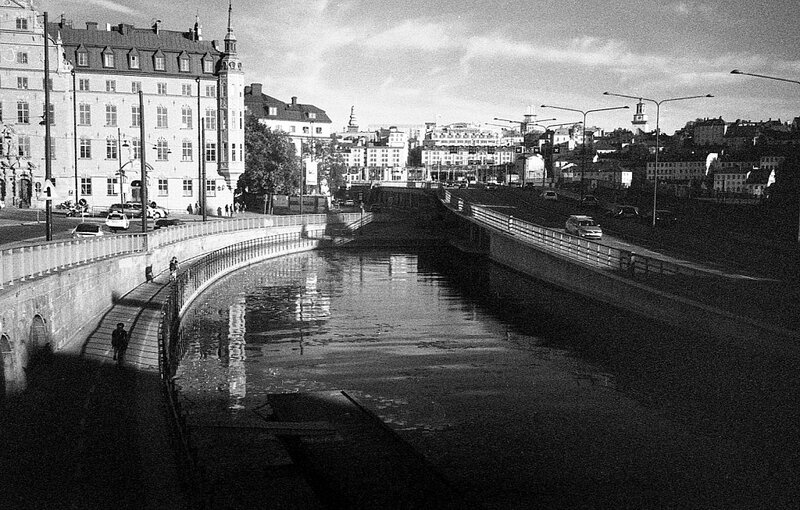 I'll write a blog post later on the 2x Bronica TC and the results. The TC actually jammed on the lens whilst I was up on the top of the ridge. Somehow I managed to keep frustration at bay, with some quick searches on the internet I found this to be a commonly reported problem, and eventually using my pocket knife I was able to force the release. As I had lots of ground to cover (and miles to drive) I decided to skip a walk around the opposite lava field and proceeded onwards to Hvitserkur - a giant double arch rocky outcrop on a beach on the northern Icelandic coast. I had to make an emergency visit to an Avis car rental depot in Akureyri after the engine light in my 4x4 turned on. False alarm - unsurprisingly the Dacia Duster has far more sensors than its reliability could handle. A small sensor failure could only be flagged by a critical alert. The fully overcast early afternoon skies along with the tide being out was not the ideal shooting conditions for this location, but the arch was still cool nonetheless. This I had realised by this point would sum up many of my photo locations. I was covering so much ground and on such a ambitious schedule that I simply wouldn't be able to be at most locations at the optimal time of day, and even if I were, the weather would not necessarily cooperate. 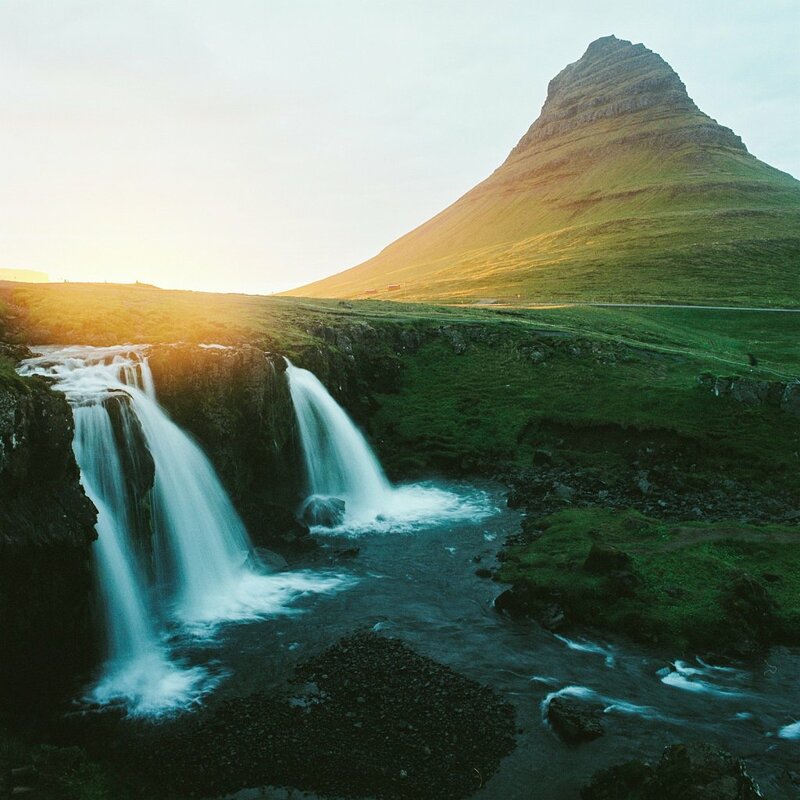 Kirkjufell is a classic iceland scene. 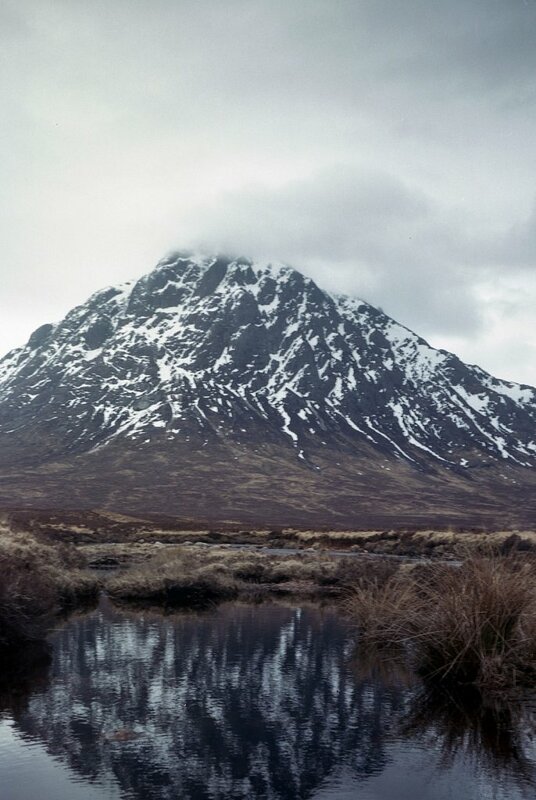 A towering mountain with a very picturesque waterfall in the foreground. At sunset the light disapears on the horizon just above the waterfall and cascades the last bursts of sunlight up the side of the mountain face. Truth be told, from the pictures seen online I thought it'd be obvious where to stop for the photo. 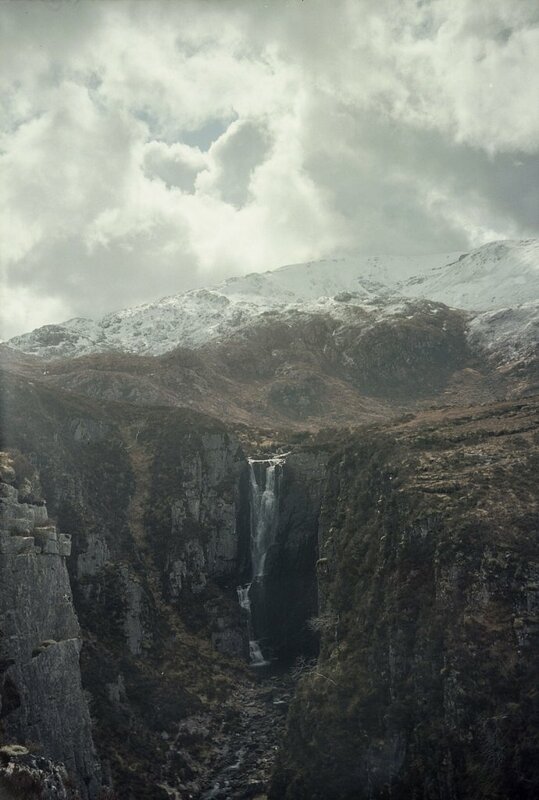 As it turns out I drove right past it, initially dismissing the small waterfall I had seen from the road. I turned around and by the time I got up to the waterfall, looking at Kirkjufell, there was already a gaggle of photographers all set up already with cameras on tripods. There was barely any room left with everyones spot staked out. Around 15 minutes later a busload of photographers turned up who managed to squeeze in the few gaps. In one of the most bizarre photography experiences I've had so far I almost saw two photographers get in a fight about a few people who had set their cameras up in front of the roped off line, and therefore in the field of view of the ultra wide angle lenses of a couple of other photographers. I could see both sides - the cameras in front of the ropes had been places some three hours ago, but on the other hand it is pretty selfish to think the rules dont apply to you and just sit there in everyones way. Its one of the less pleasant things about photographing in such a popular location for me, and also highlights an absurdity in the photography community - we all want our own slight variation of that classic shot. There is a nice local campsite in Olafsvik with a shower and nice WC facilities. From here I continued on the Snaefeness peninsula. Unfortunately the Snæfellsjökull glacier that inspired Jules Verne was shrouded by thick clouds, but there were a few nice coastal viewpoints. Its a nice detour to avoid doubling back on oneself from Kirkjufell. I finished the trip by taking the golden circle, which is a marketing term for the sights relatively near Reykjavik - Þingvellir National Park, Geysir and Gulfoss. To be honest, after the rest of the sights I had already seen, and the 10x number of people at these, I was underwhelmed with the exception of Gulfoss. Even though I'd seen what seemed like a million waterfalls by this point, I'd be lying to say that Gulfoss did not impress me greatly with its grand canyon and rainbow above the falls. Iceland is a photographers paradise. There are so many interesting geological features to capture and it doesn't take much of a detour to find unique places to capture. 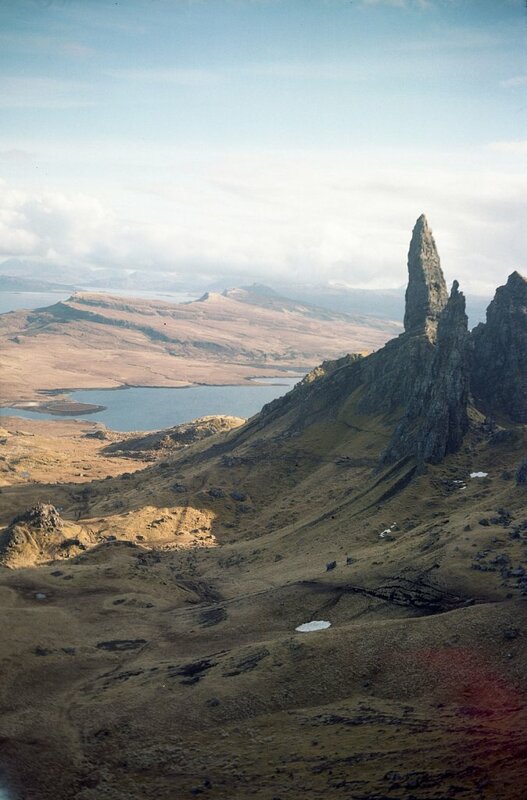 Whilst its well worthwhile seeing the key sights, its worth bearing in mind to set your expectations that the number of other photographers and tourists will likely be high there, particularly in summer. Therefore its essential to visit the sights you are most concerned with capturing in early morning or late at night. For my trip, I knew it would be a stretch to try and see as many sights as I did. It certainly was a trip that involved a serious amount of driving, and little window at each sight to wait a few hours for improvements in light or weather. 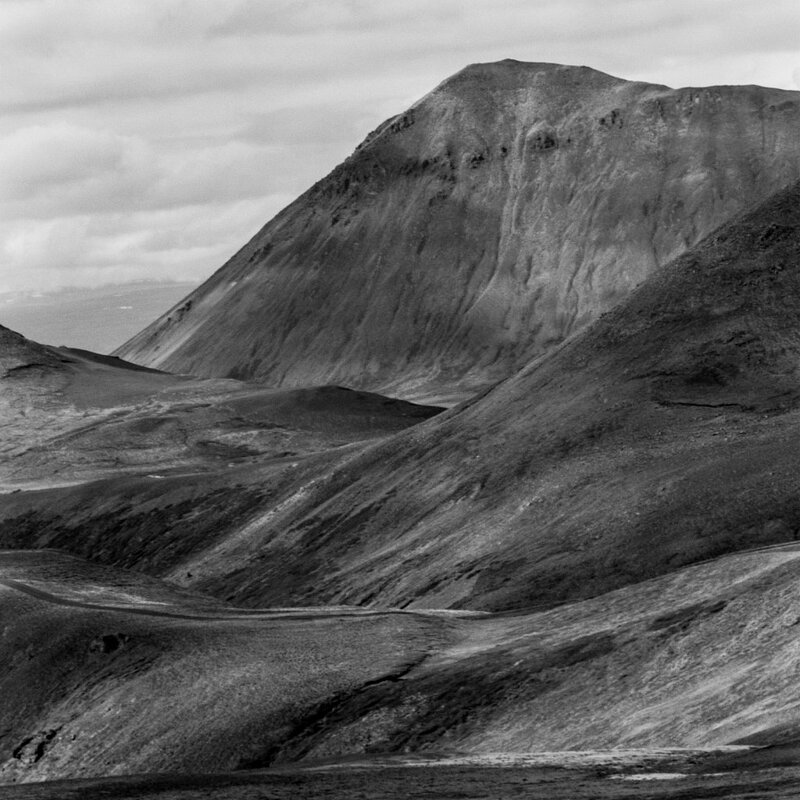 Iceland is epic, but with overcast dull light, there is a good chance of disapointing photos. After all, this isn't a photographer's disneyland, where the conditions are on demand. 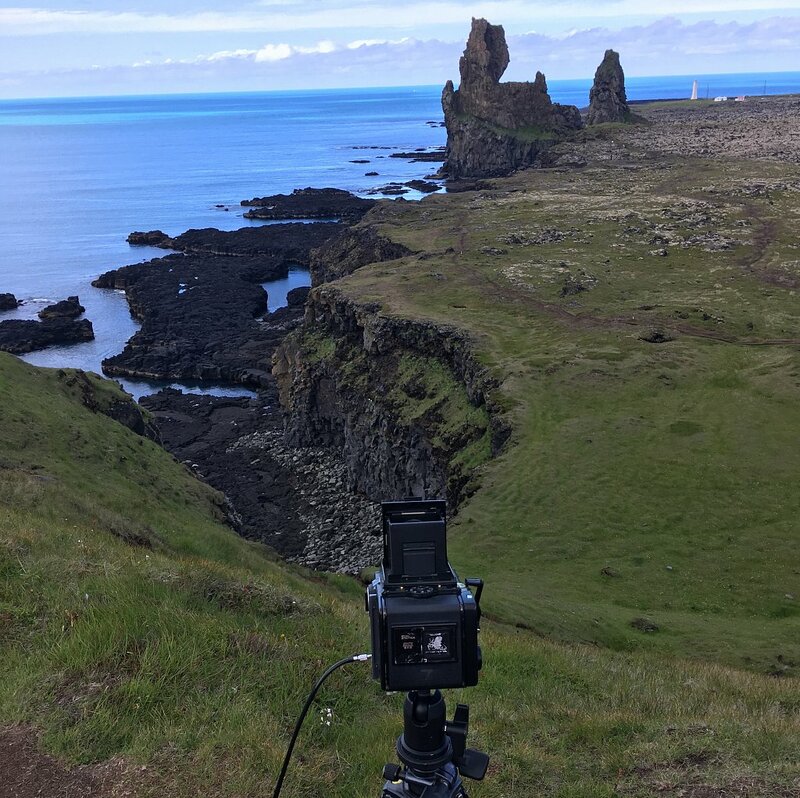 If I am to visit again on a photography trip, I'd probably do less sights and stay in one area longer - probably on the south between Vik and Hofn and venture inland on some F roads. My favourite sight was probably Dettifoss, closely followed by Jökulsárlón and the glaciers by Skaftafell. I'm still digesting the photos rom the trip. Its funny how initially when I get back my developed and scanned film I am generally disappointed, and then after a couple of weeks they grow on me as I appreciate their subtlety more. 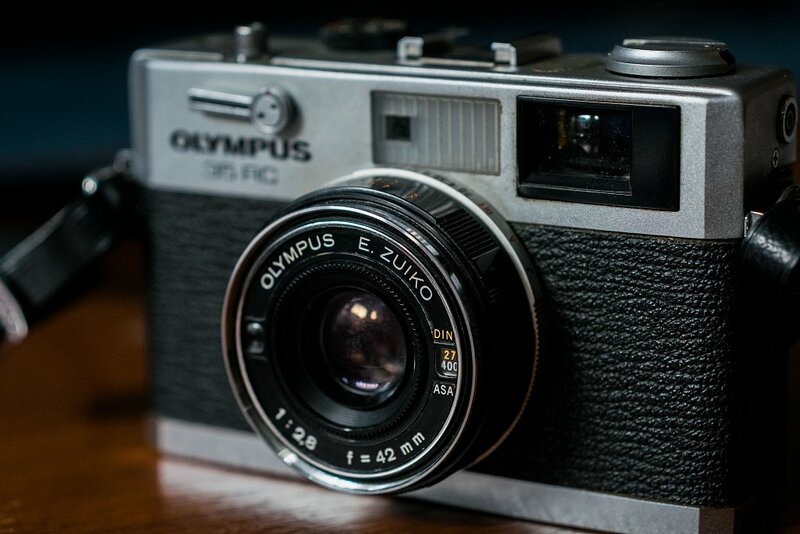 To my eye there is something quite special about the 70s era rangefinders that Olympus put out. Their design is pure class, optics excellent and build quality solid. There are 3 models of interest: the 35SP, 35RD and 35RC. The former two are both larger and sport a f1.7 lens (42mm and 40mm respectively) whilst the much smaller RC has a 42mm f2.8. I have been drawn to these cameras for some time, wanting to try out the rangefinder experience without leaving a Leica sized hole in my wallet, and during 2012 I ended up picking up a nice condition 35RD for little more than £40 on eBay. 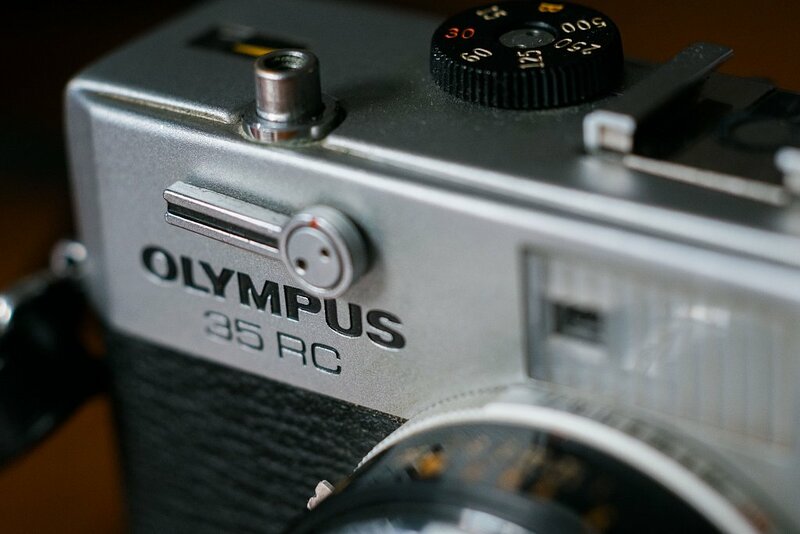 Ultimately the Olympus 35RD did not really gel with me (my impressions are summarised here) and unfortunately after a couple of years of ownership the aperture blades became sticky leading me to sell on for "spares or repairs". Despite the shortcomings I perceived, the design/ergonomics (aside from shutter speed selection on the lens itself) and fully mechanical manual operation were things I really enjoyed, and this is what led me several years later in wanting to try out its smaller (and 55 gram lighter) brother, the 35RD. 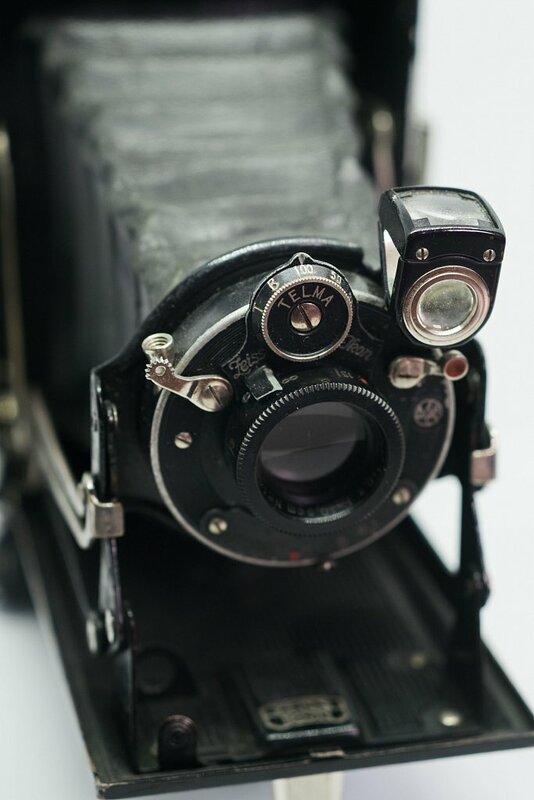 Needless to say with the continued resurgence of analogue camera popularity this range of shooters are seeing their values dramatically increase. You used to be able to pick up a decent condition 35RC for a much more reasonable price than one can today. A cursory eBay scan shows good-mint condition models to be around the £100 mark. I was not prepared to pay so much and would be willing to take the risk on a more well used model to try out and deduce if this would be a camera that I'd enjoy using. So I went ahead with a £40 purchase of a "functional" camera but with a few warts. Most notably some scratches to the lens and potentially leaky light seals. Nevertheless I was feeling optimistic, and maybe these detriments would not be so impactful to actually using the camera. 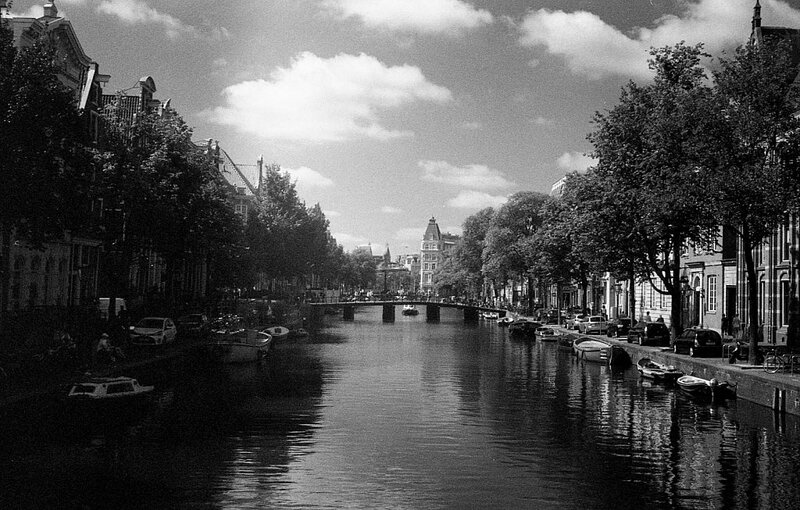 So in a test roll of TMax 400 went and the camera was packed in my luggage for a couple of business trips to Copenhagen and Amsterdam. The first thing that stuck me about this camera was the size. Compared to the 35RD this was a far more pocketable camera. The body is indeed a bit smaller, but the huge advantage of the RC's f2.8 over the f1.7 lens on the RD is that it is far more compact. As for ergonomics the shutter speed on the RC is selected via a top dial which I find much more intuitive than the on-lens design of the RD. The film advance lever looks a little unconventional on the RC compared to a more traditional design on the RD but the practical use of it works out quite nice with the thumb easily catching the slightly knurled lever. The travel in focusing the lens is really short, which could be an issue if you need precise zone focusing at short distance ranges / wide apertures. This didn't bother me too much as I was tending to take pictures between 5m and infinity. The viewfinder nicely shows both shutter speed and aperture used via a needle implementation that fixes on the settings when the shutter is half pressed. One other weird thing is the 43.5mm filter thread but there are plenty of these available on eBay (I myself picked up a Hoya 25a Red Filter to try on it). Some of the best shots from the test roll are above. Unfortunately the light seals do need replacing (as you can make out on the shot above) but this should be straight forward as I decided to try out a seller on eBay who advertises "Laser Cut" light seals ready for this specific model of camera. The size of the camera and its function of being fully manual without the need for a battery (which is good since this model was made for a dreaded PX625 mercury cell) are the killer attributes for me in this camera. For my test roll I just used Sunny 16 metering but I'll probably try out the in built meter with a Wein Cell to see if it still works. Overall I'm pretty happy with the camera. I'll fix up the light seals and shoot a few more rolls with it to see if the lens scratches are bad enough to materially impact the contrast.